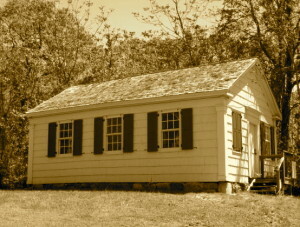 The Bald Hill School House has long been a historic monument to those born and raised in Farmingville. 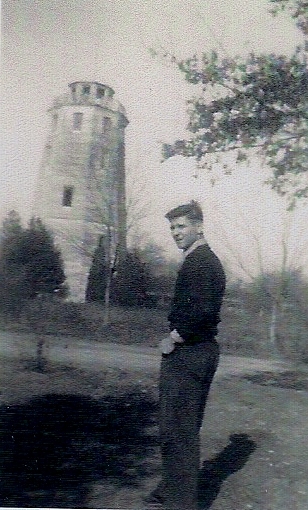 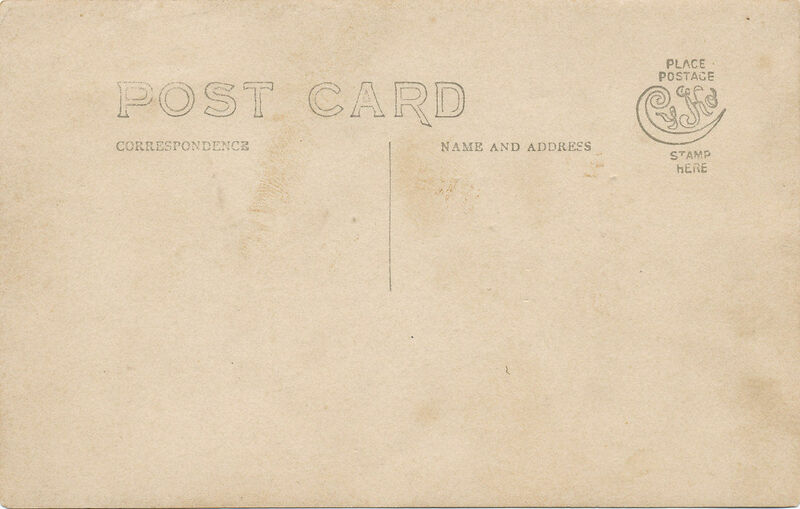 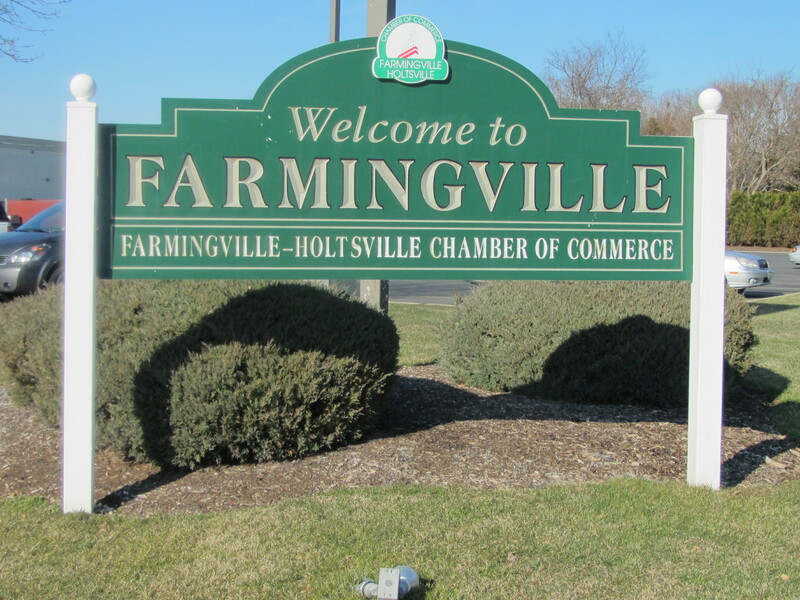 It was here that the teachers helped teach the youth of the burgeoning town of Farmingville. 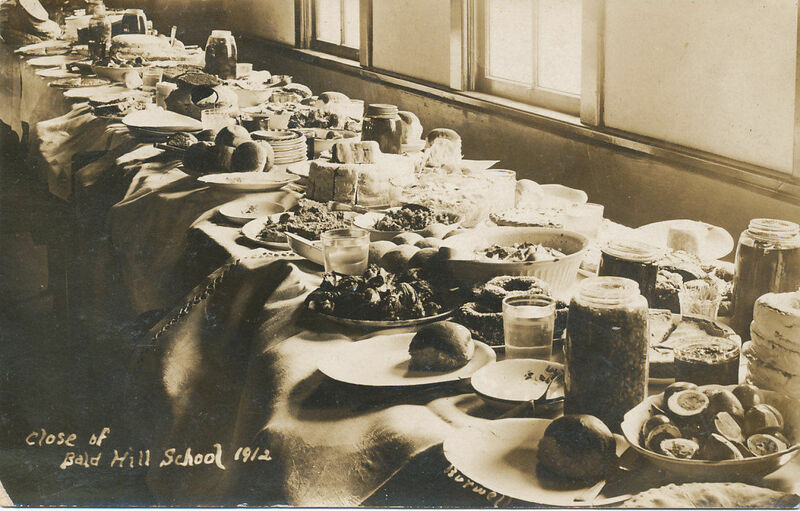 In time those youth, now adults, would come together at the school house every year to have a picnic and reminisce about their time in the School House and the positive impact it had on their lives. 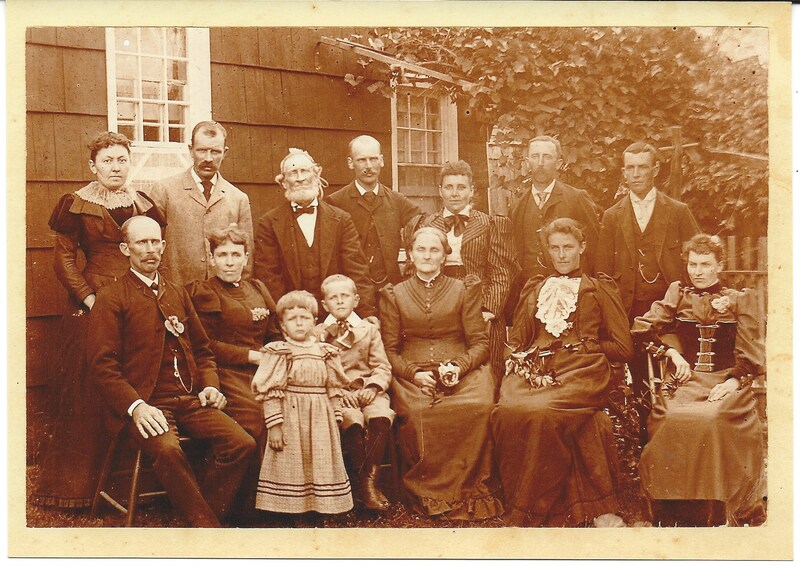 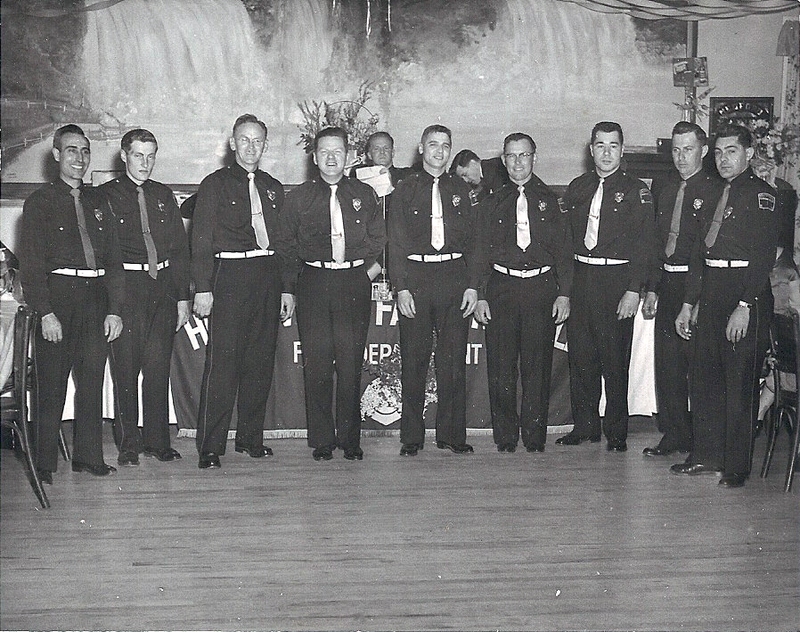 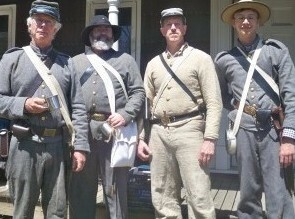 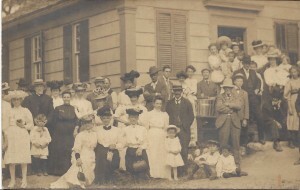 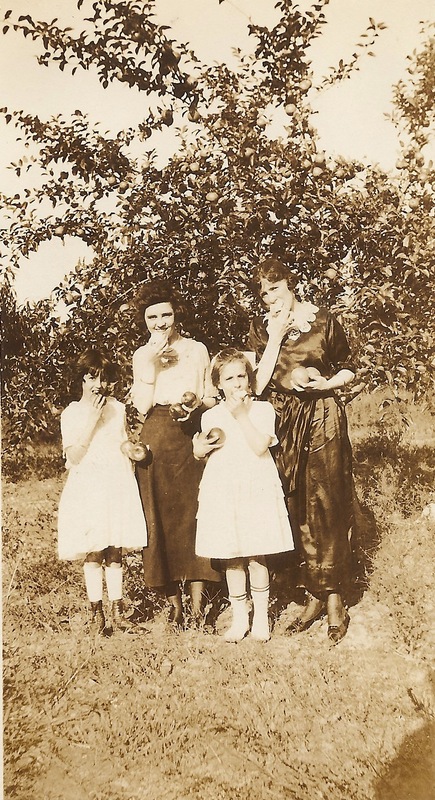 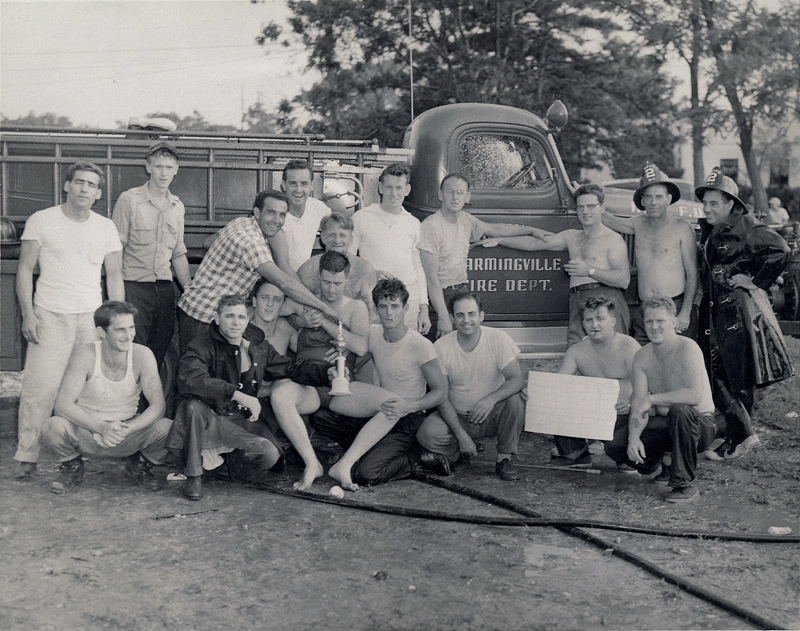 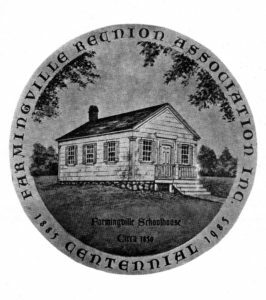 Through these annual picnics the Farmingville Reunion Association was formed in 1885. 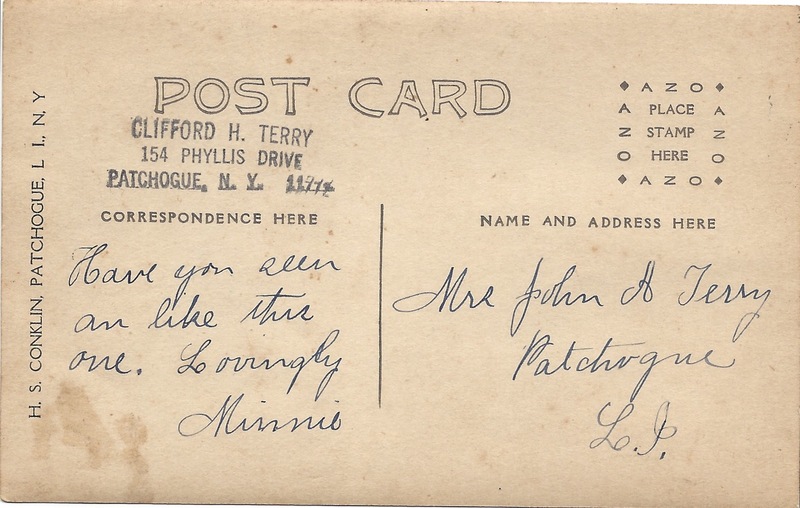 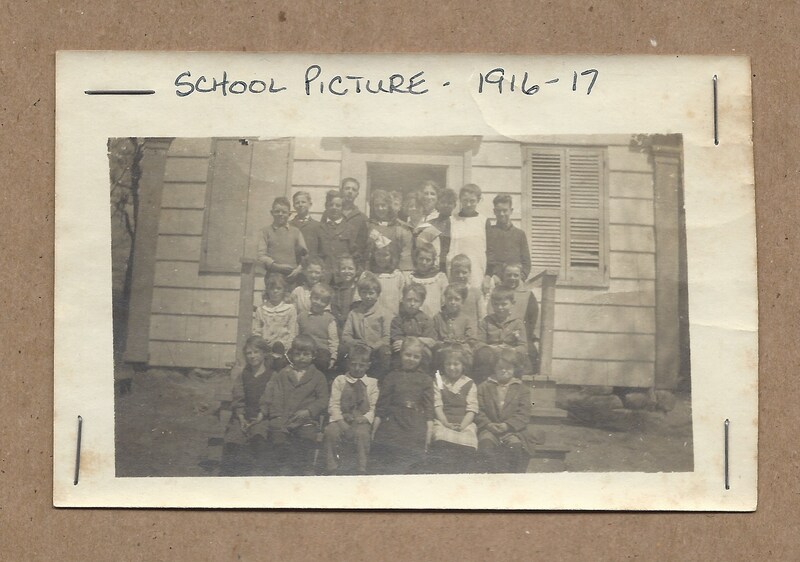 In 1928 the people in School District No. 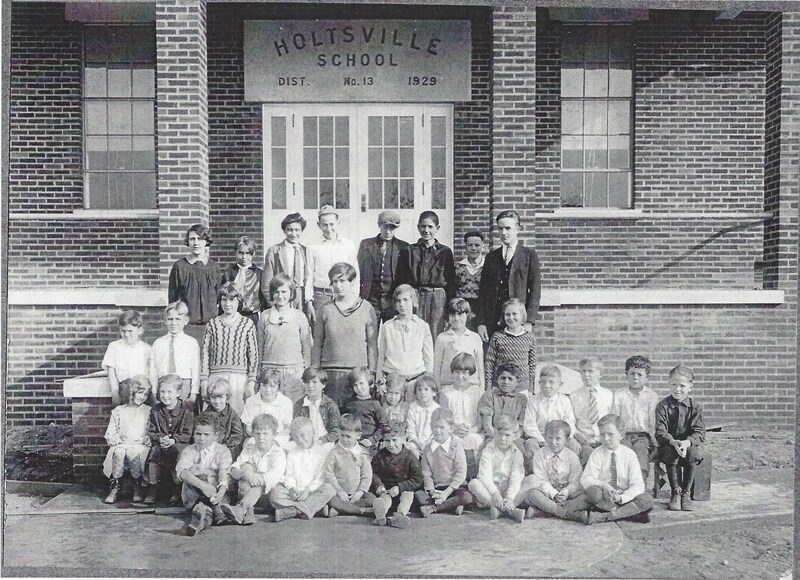 13 voted to consolidate with the Holtsville school district and the decision was made that a new school house would be built to house the new student body. 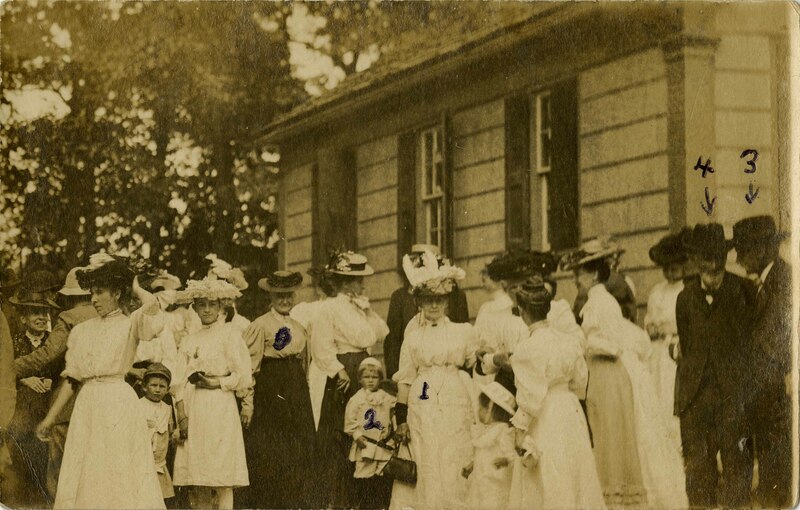 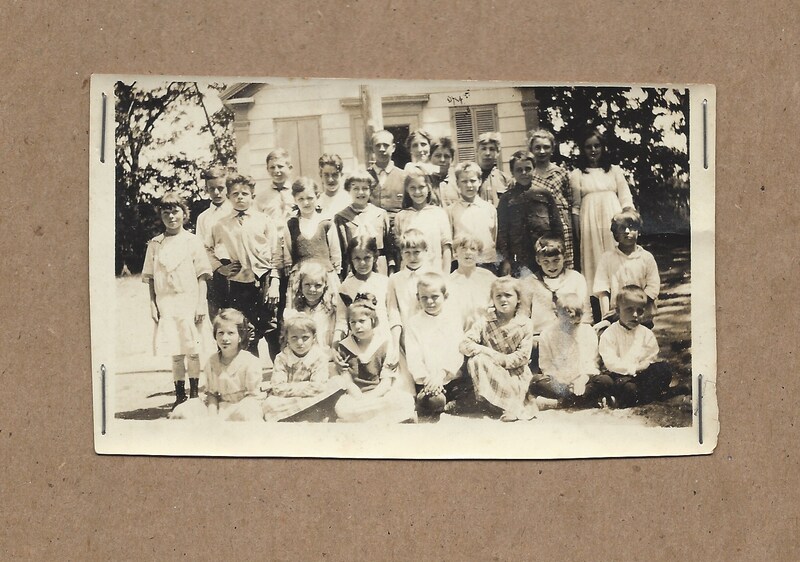 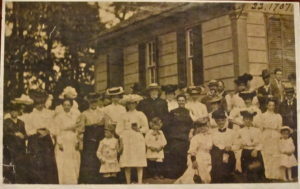 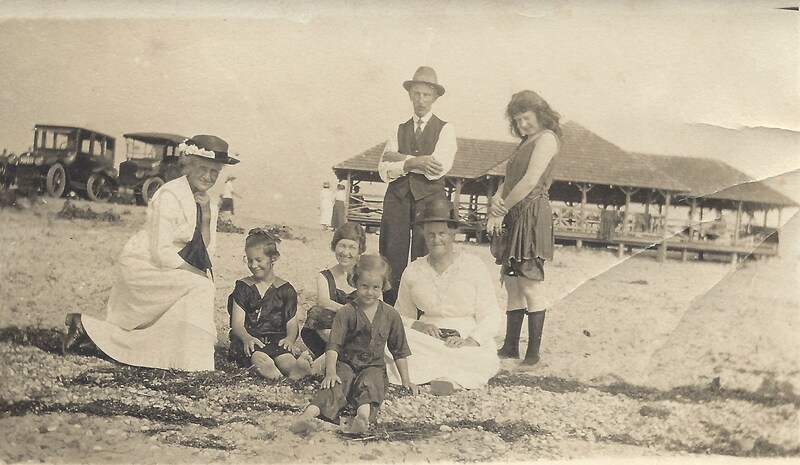 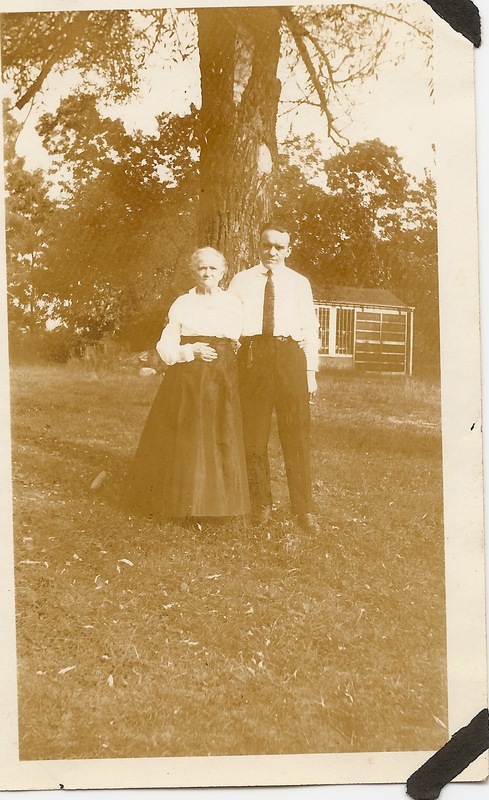 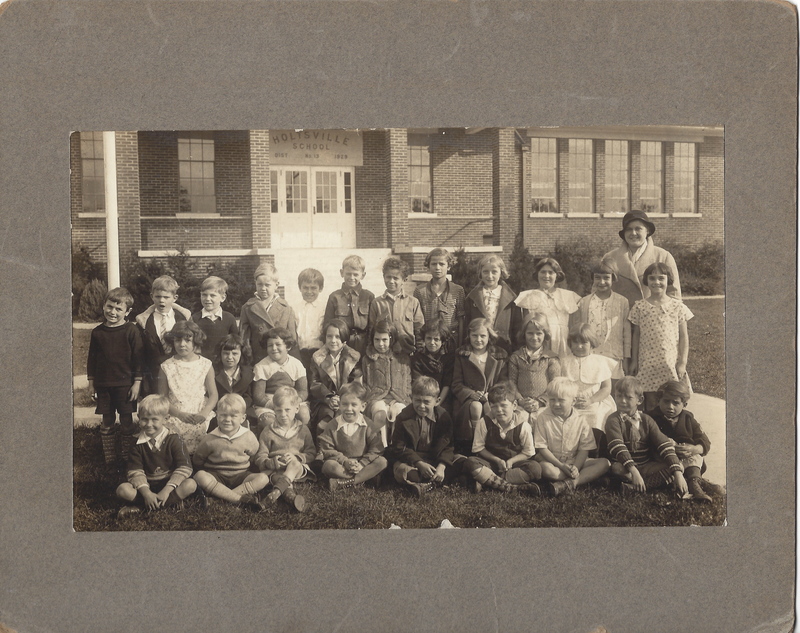 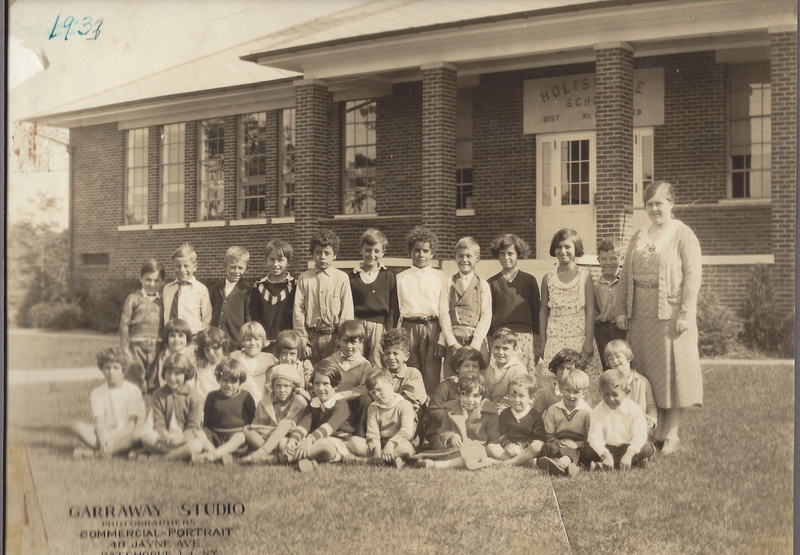 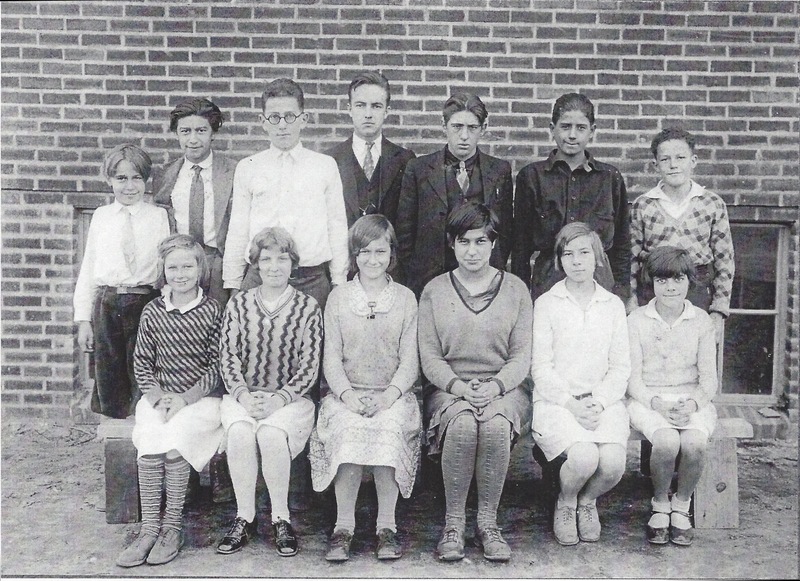 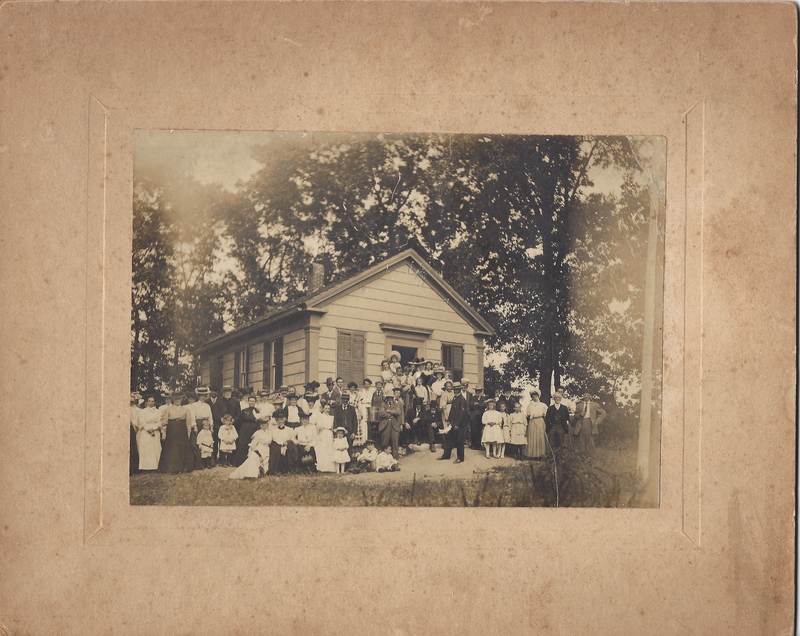 At the 1929 picnic everyone learned the distressing news that their cherished school house would be removed. 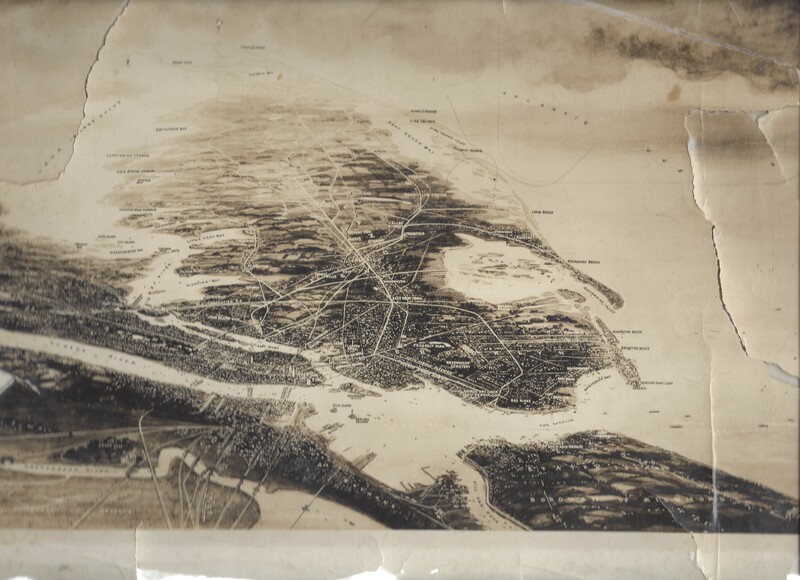 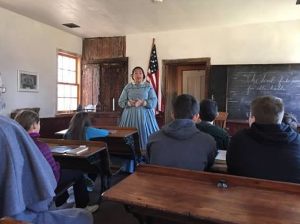 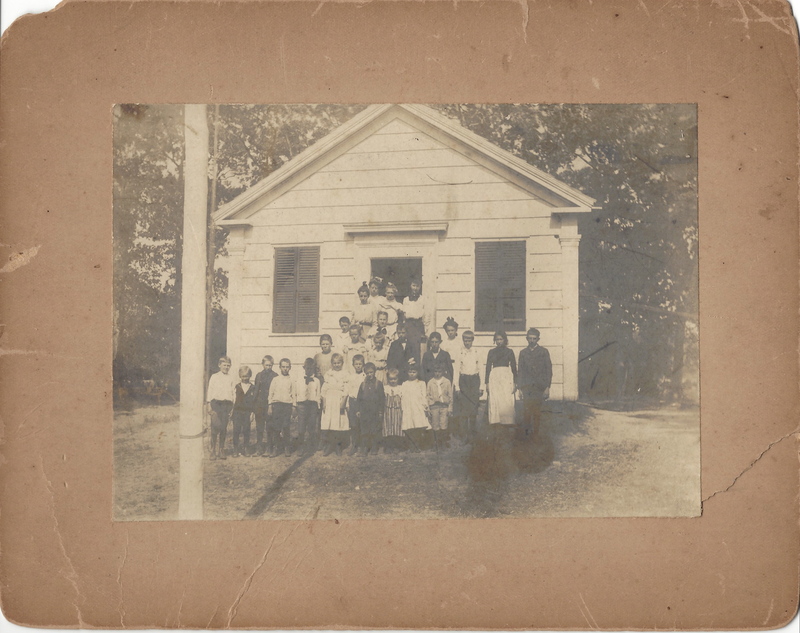 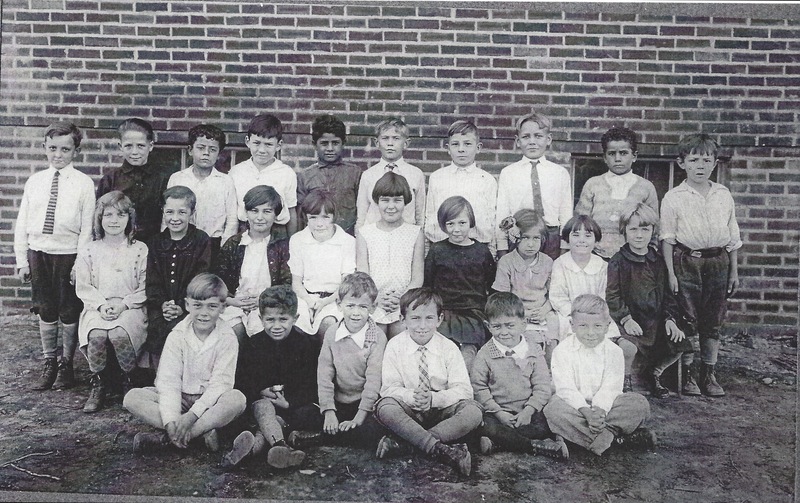 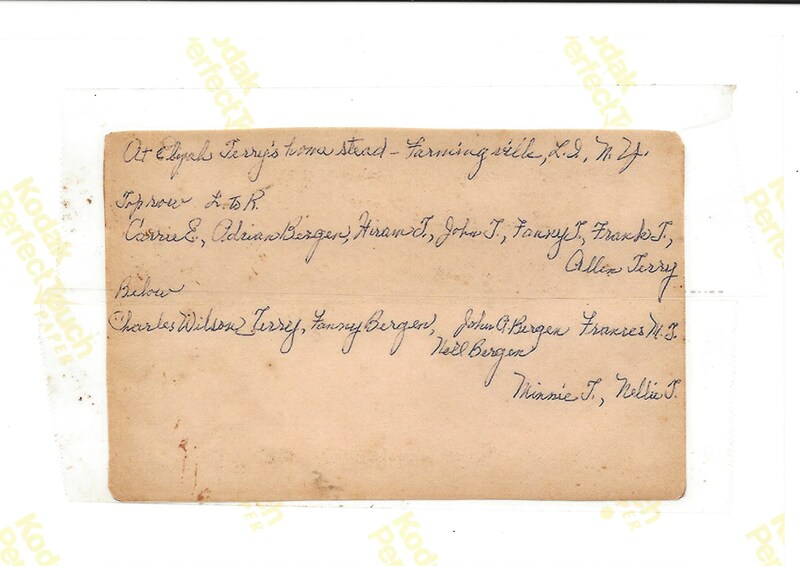 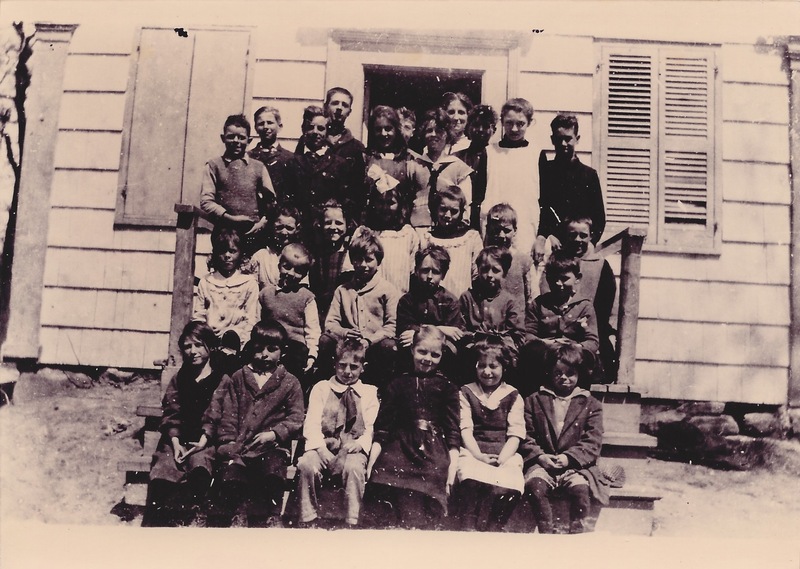 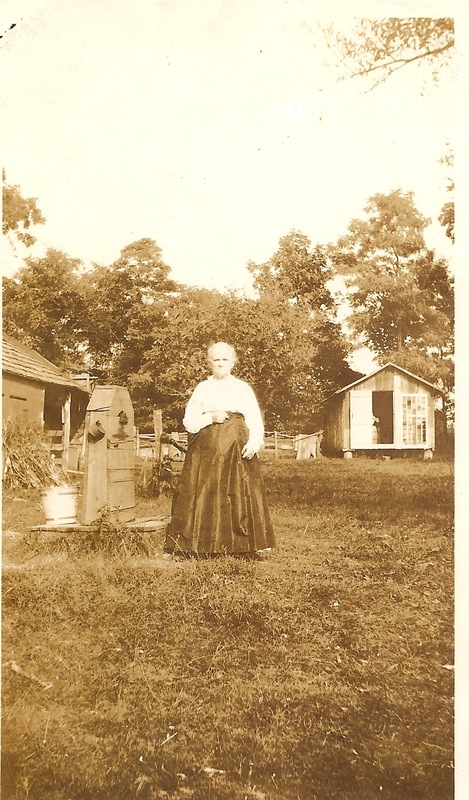 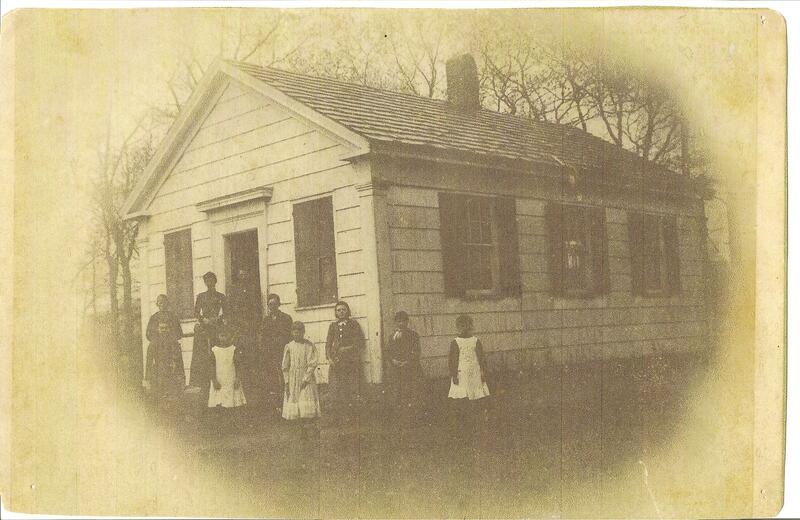 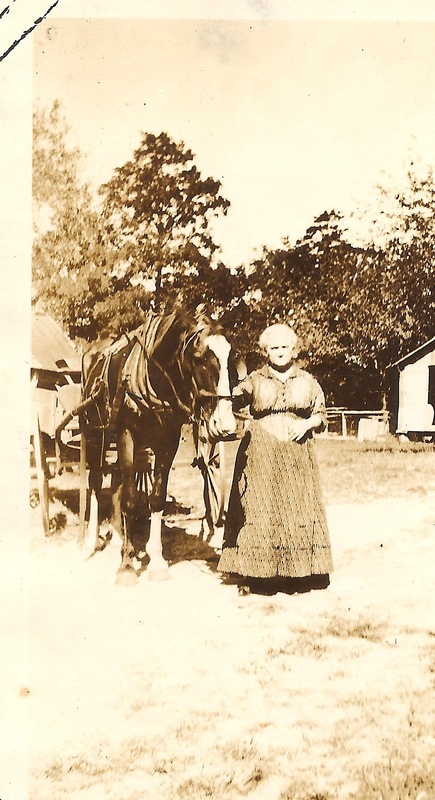 After finding out about the consolidation of the districts and removal of the Farmingville School House Mrs. Emeline Terry came up with the idea to form a formal association that would work to save their School House. 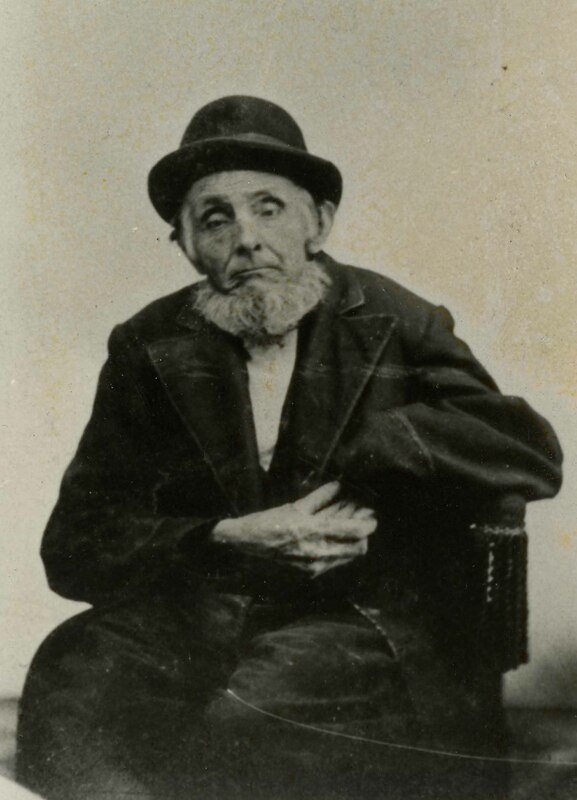 Septer E. Terry (grandson of Elijah Terry) became the first chairmen of this newly formed union. 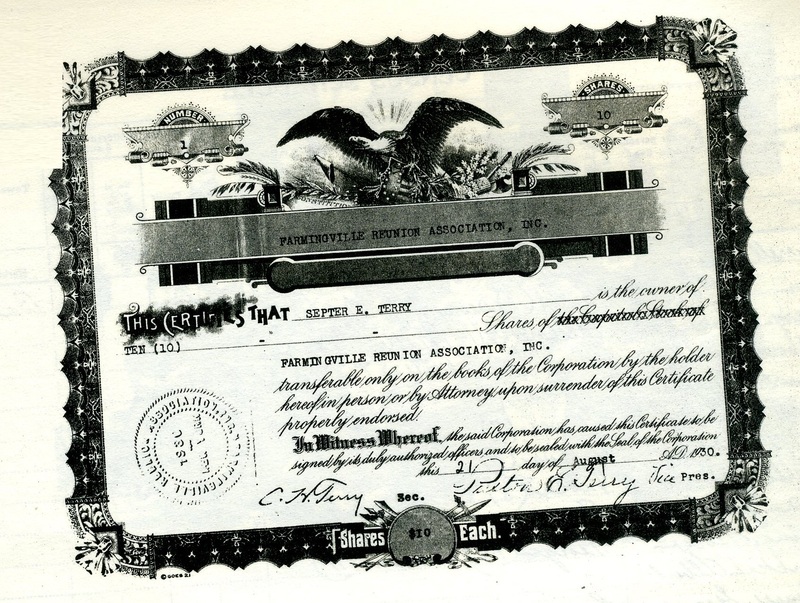 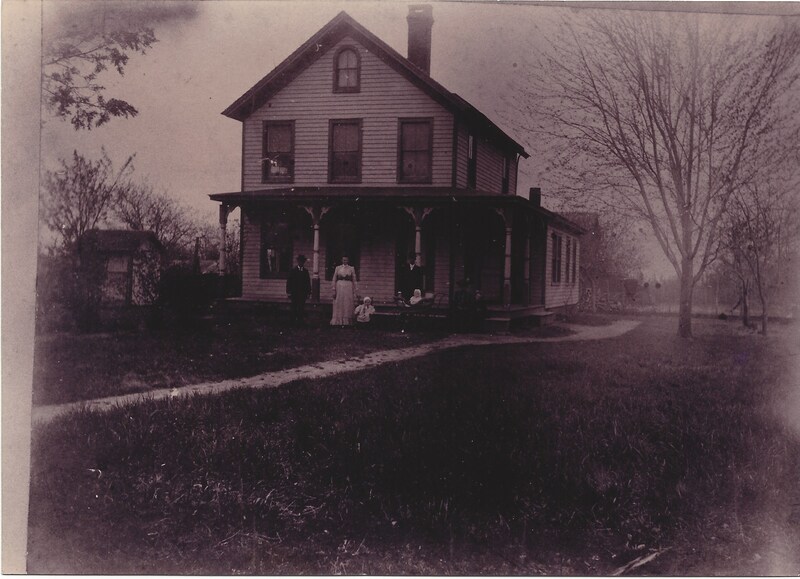 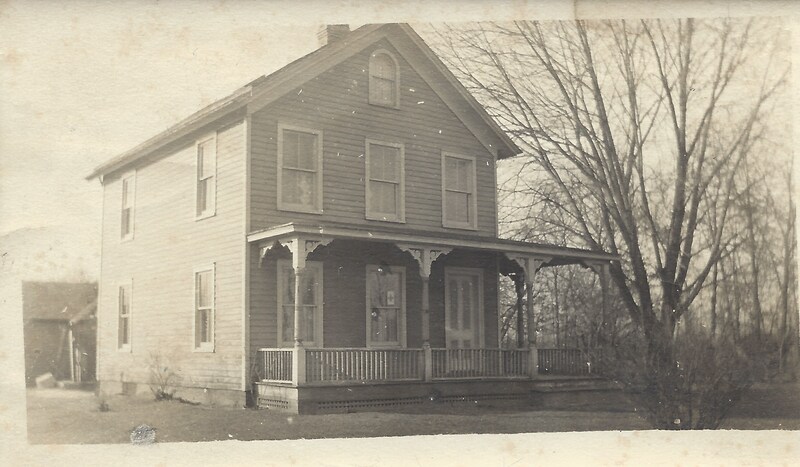 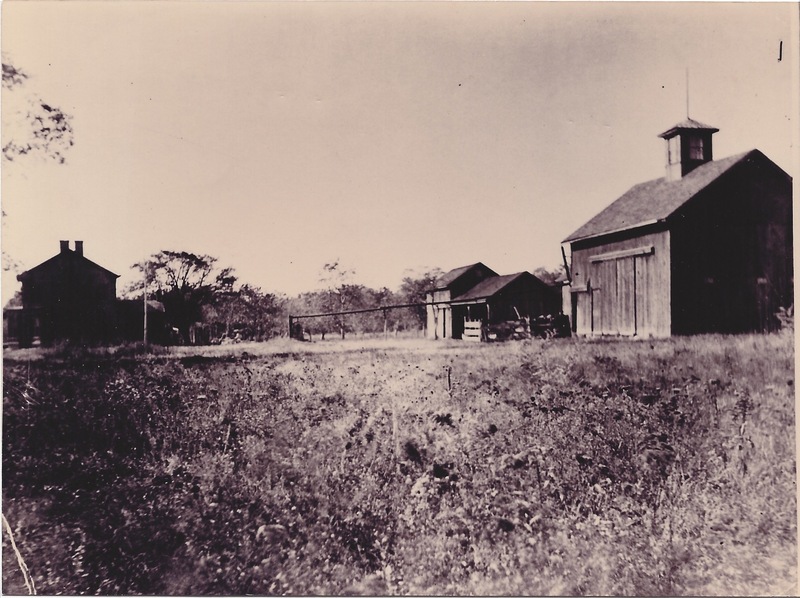 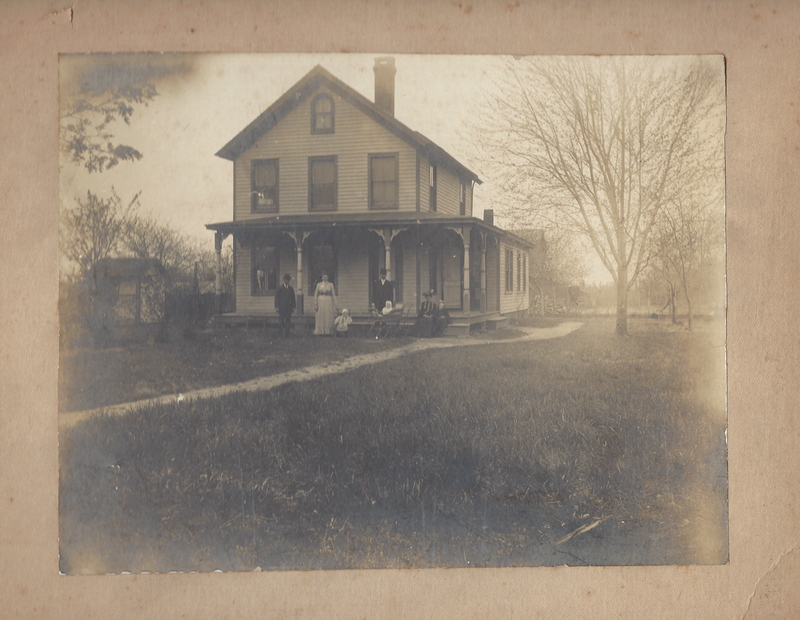 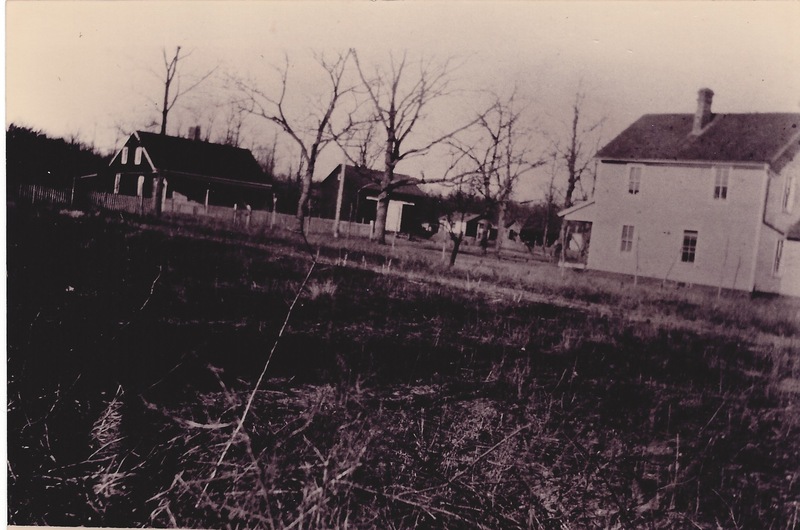 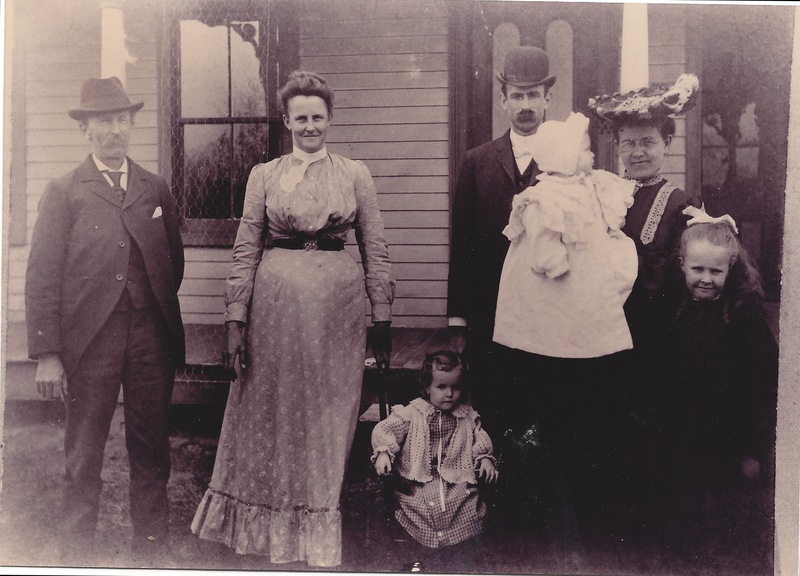 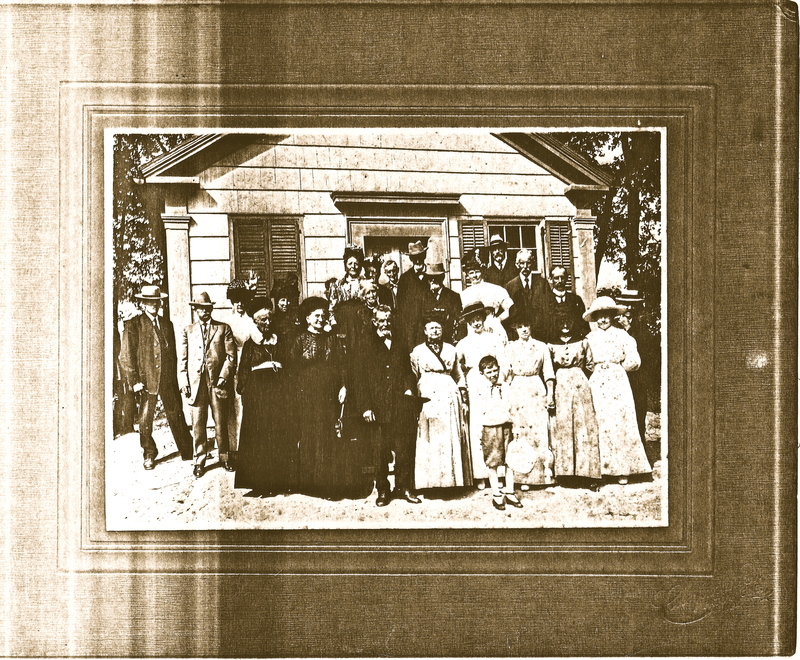 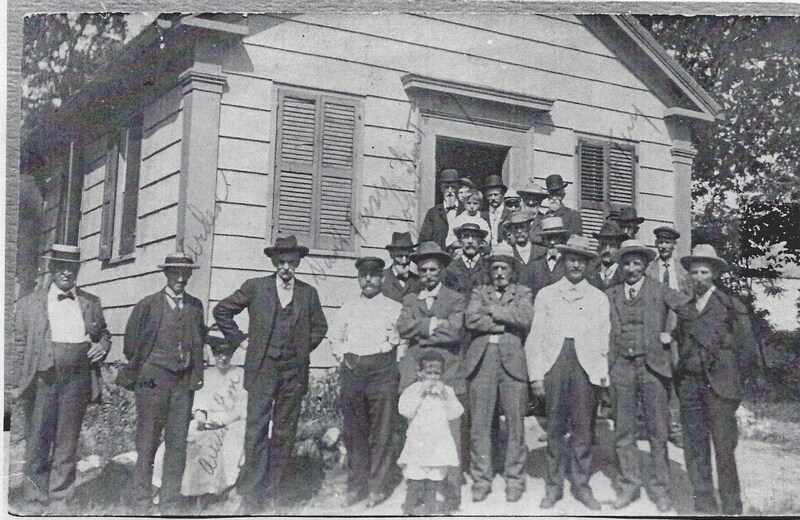 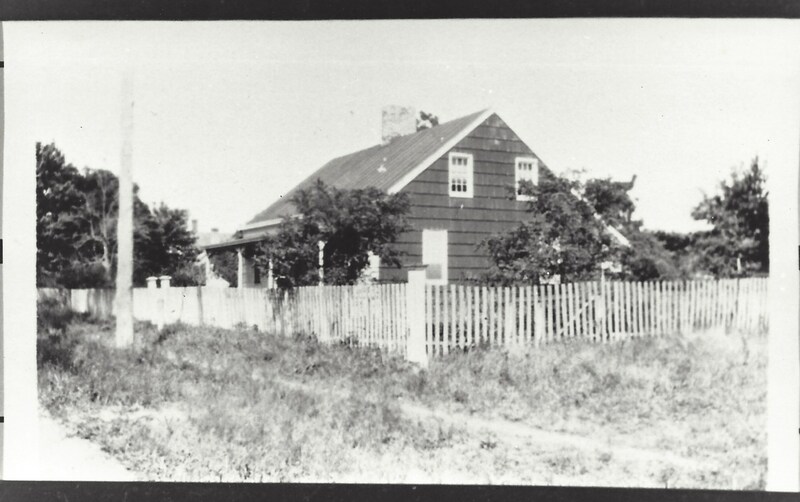 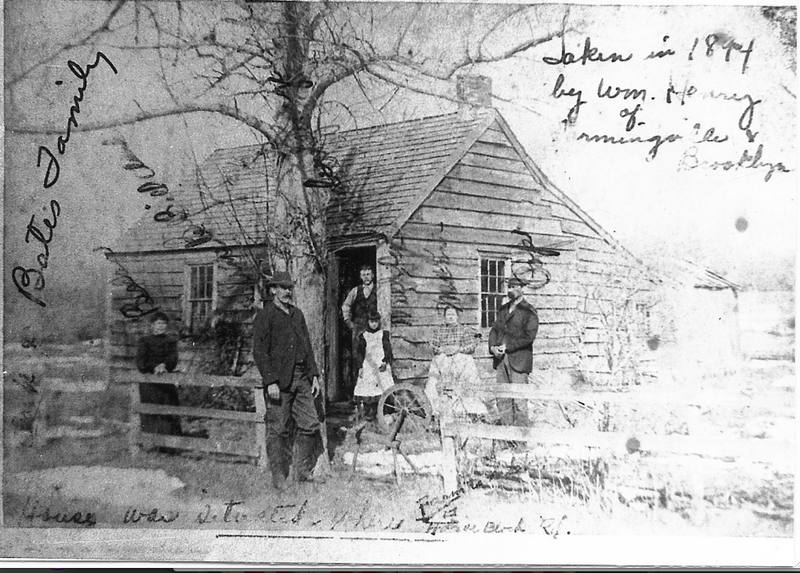 It was agreed that shares of the home would be sold for ten dollars each (as seen in the picture below Septer E. Terry had purchased ten shares himself to help save the School House). 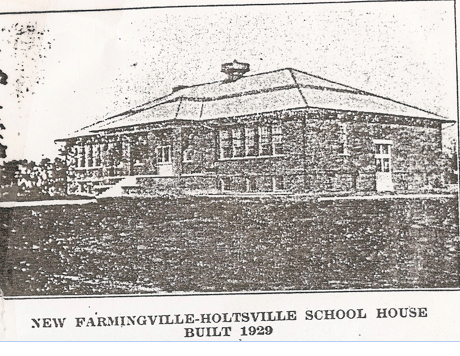 The money that was raised would go towards saving the School and each member of this new union would have equal parts in the care and maintenance of their hallowed school. It was recorded that the shares sold equaled about $1975.00. 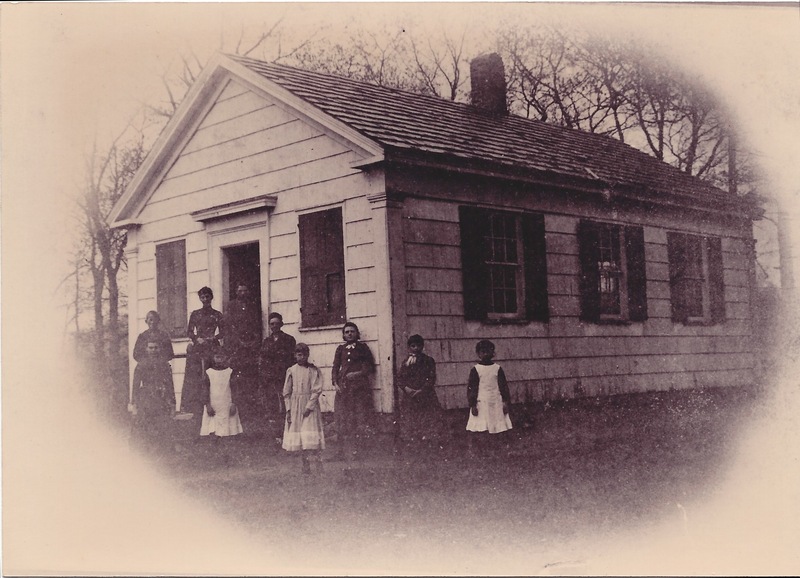 The Association used this money to empower Mrs. Wendell Still of Selden to buy the schoolhouse and the 2 1/4 acre grounds where it stood. 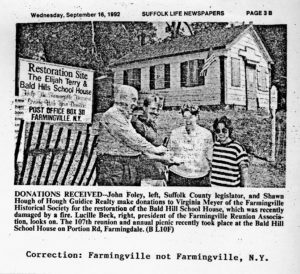 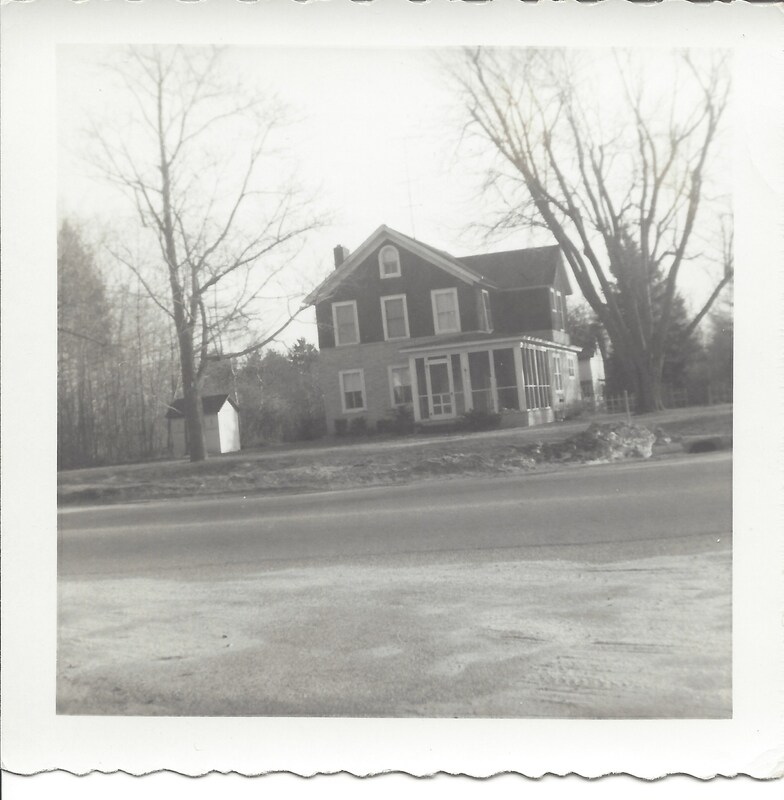 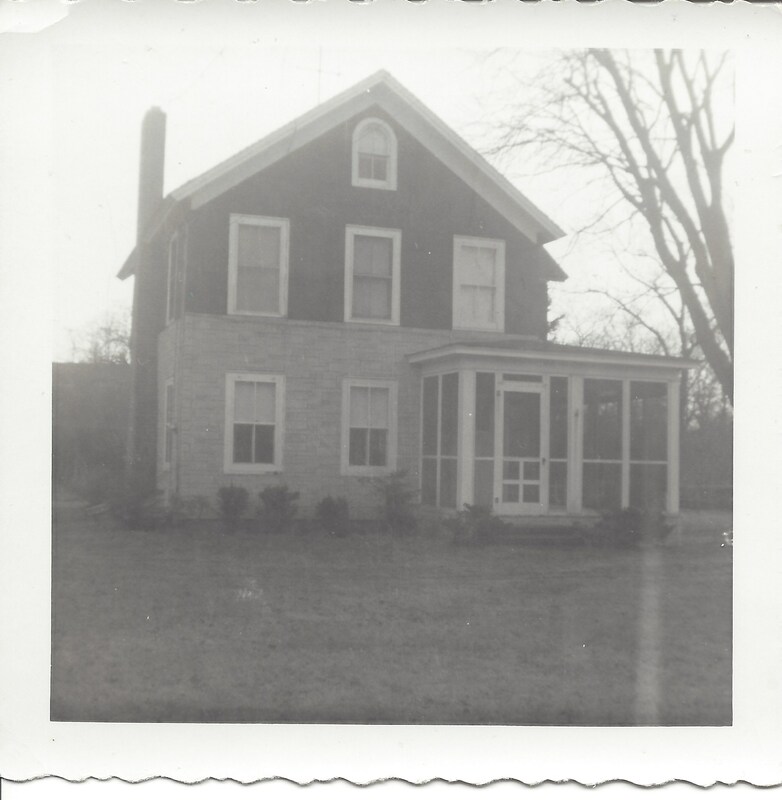 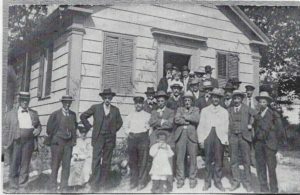 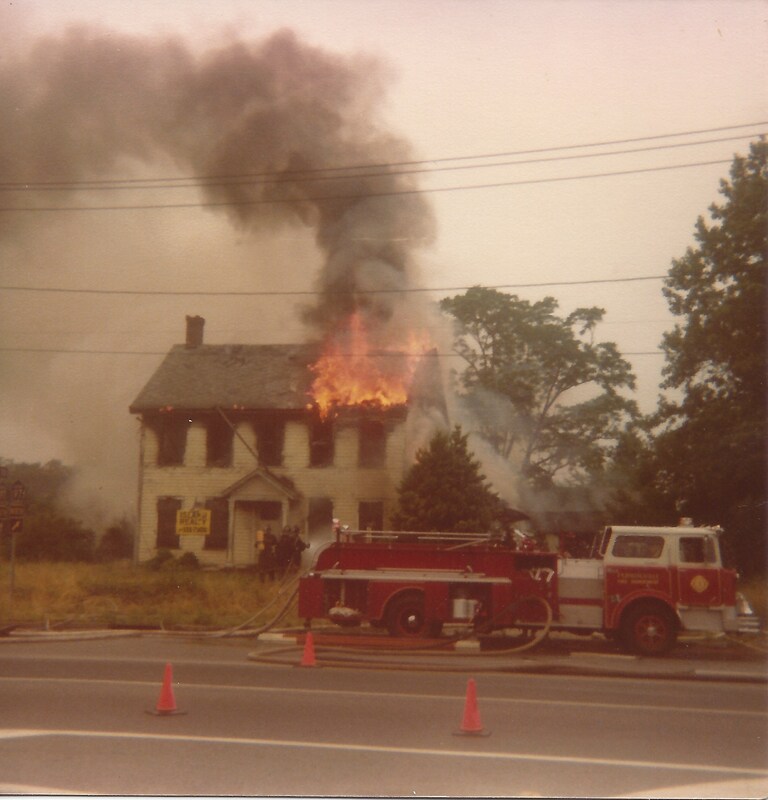 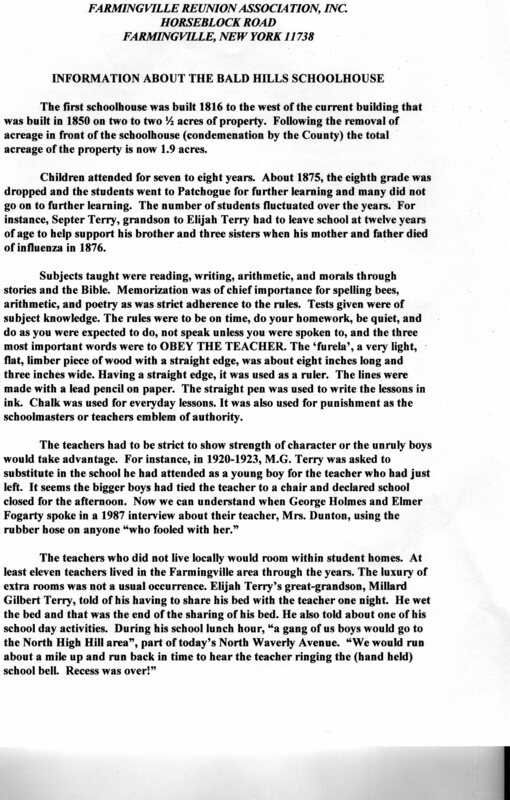 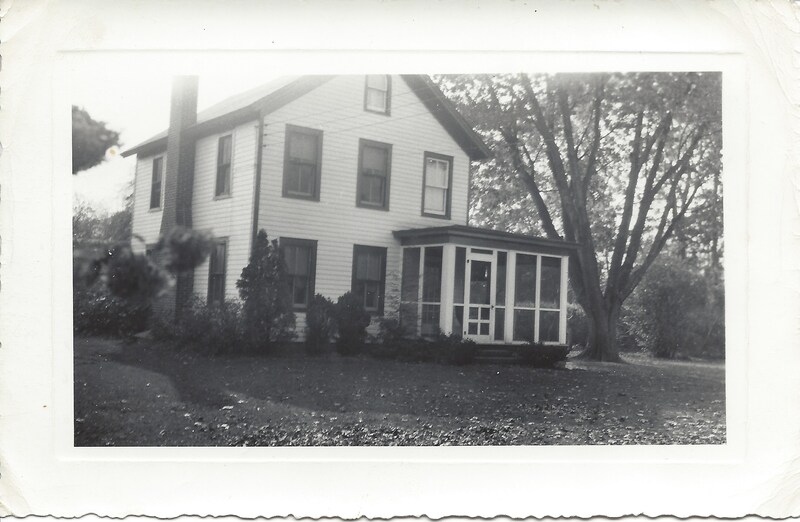 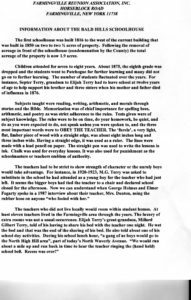 In 1985 the Farmingville Reunion Association came to the rescue of yet another important historical building, the home of the first school teacher Elijah Terry. 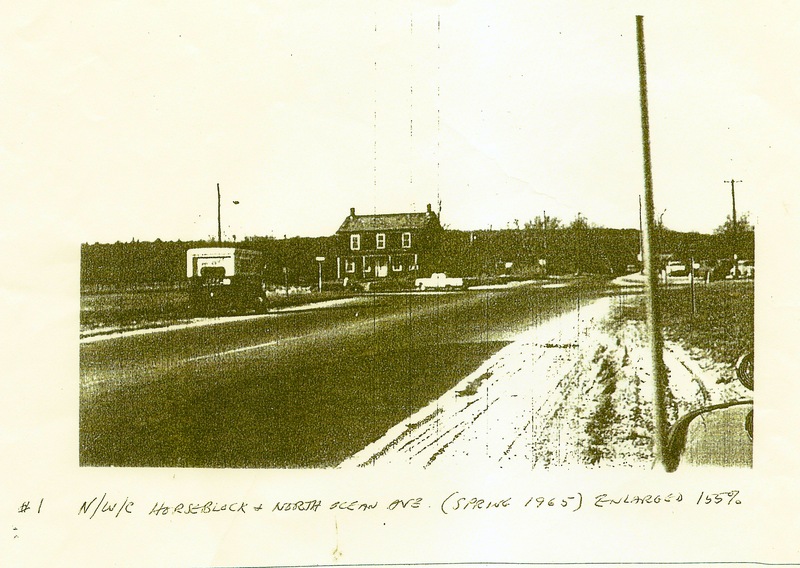 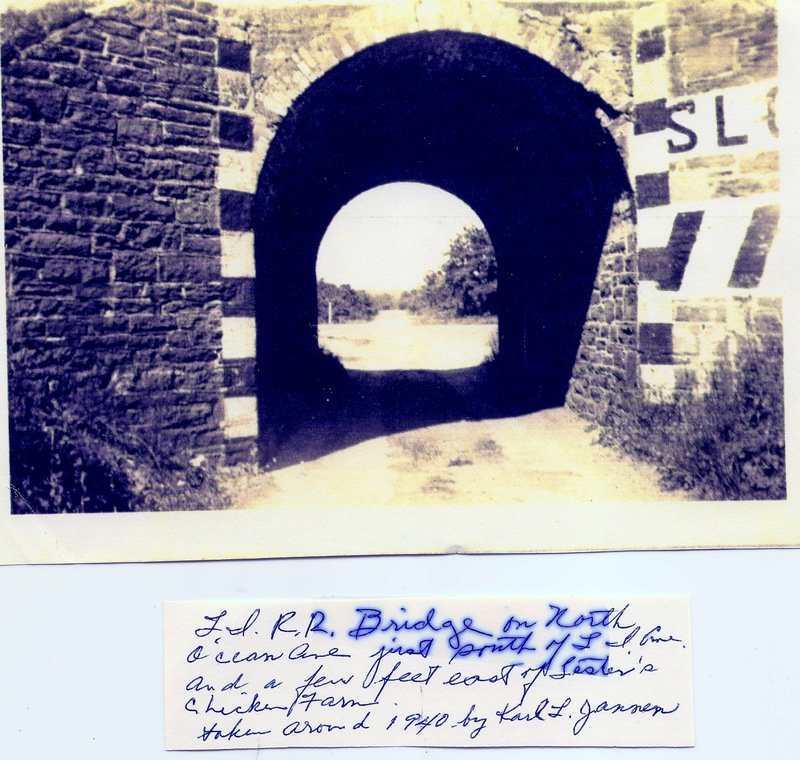 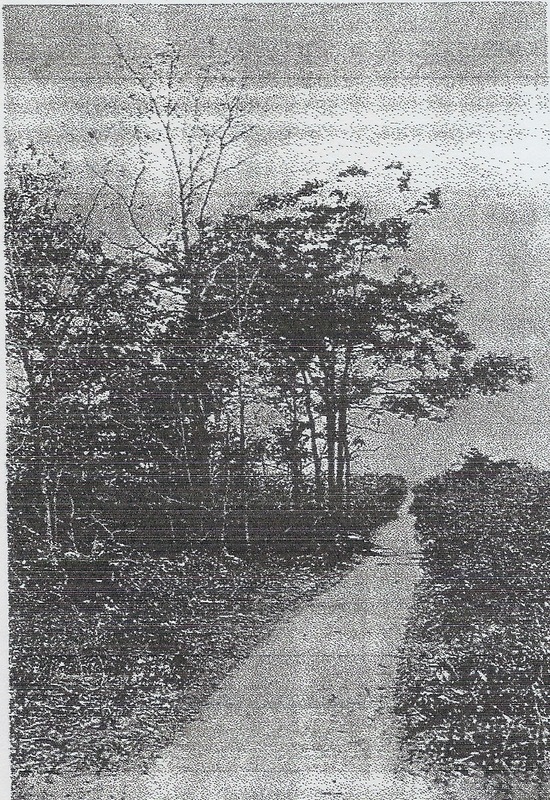 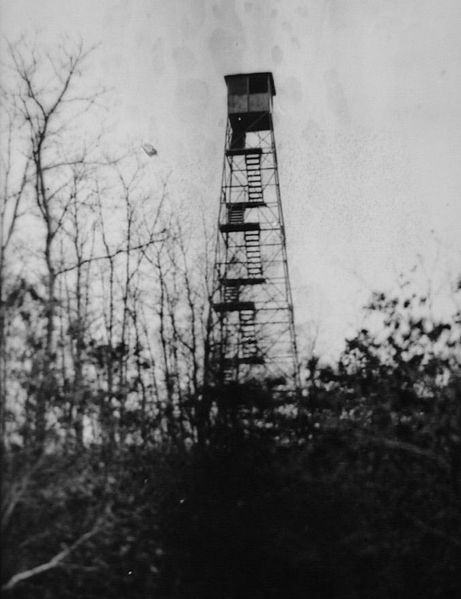 The county had decided to widen Horseblock Road and the home of Elijah Terry was in the direct path of the construction. 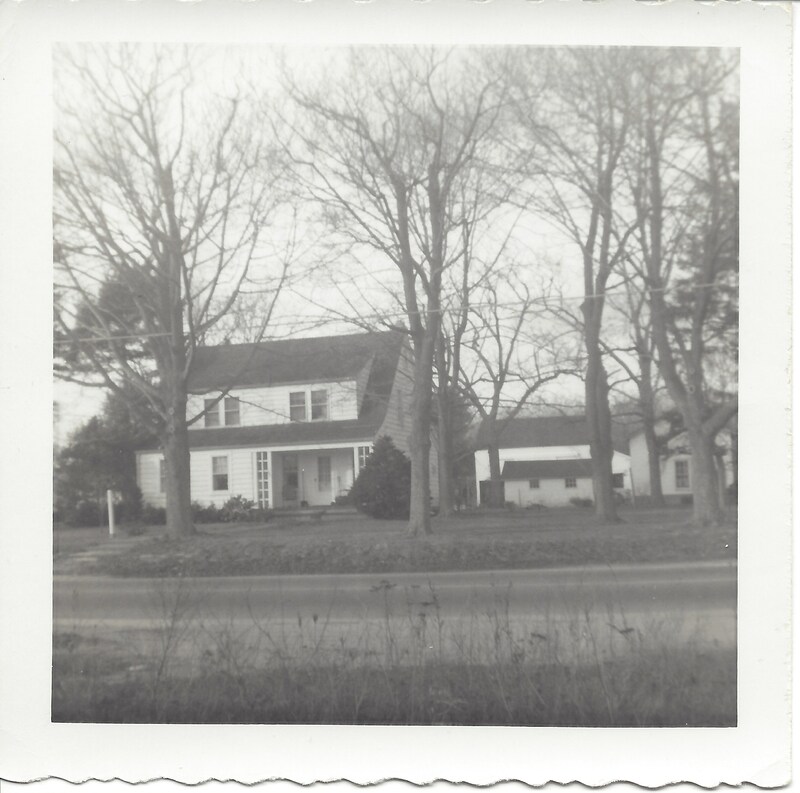 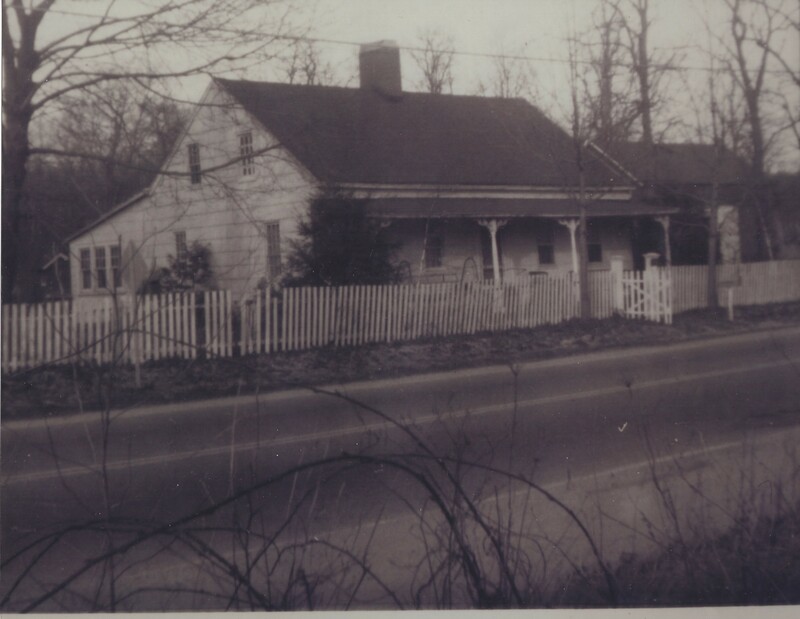 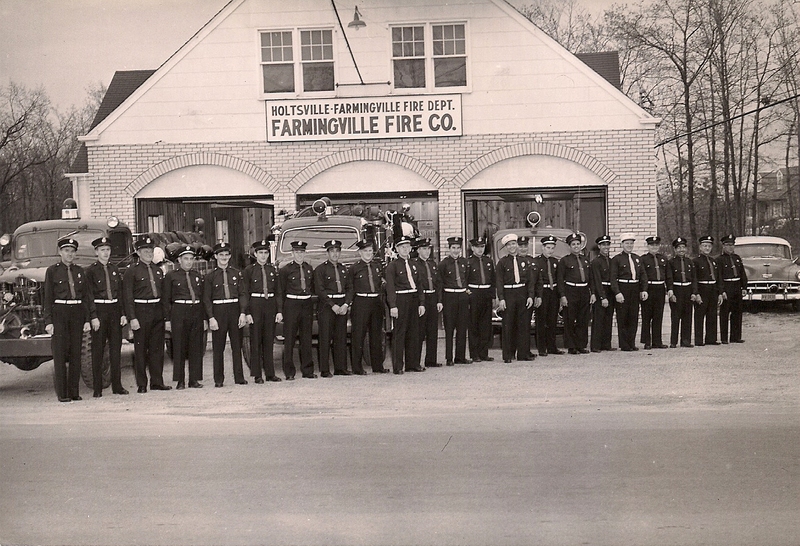 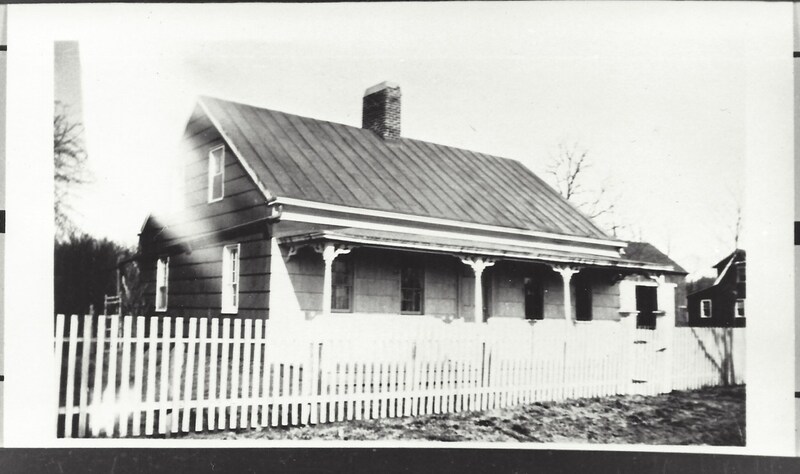 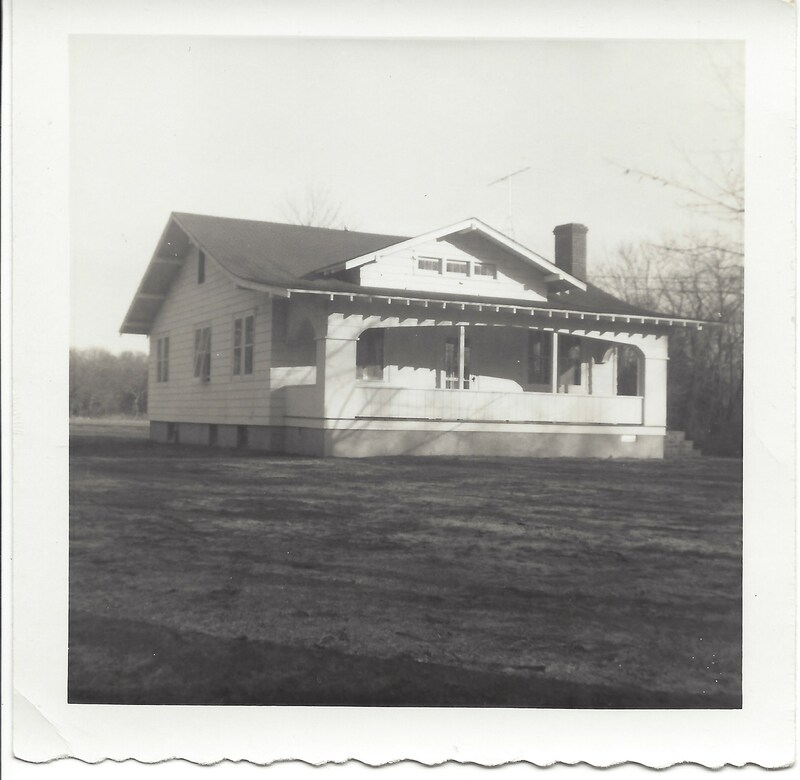 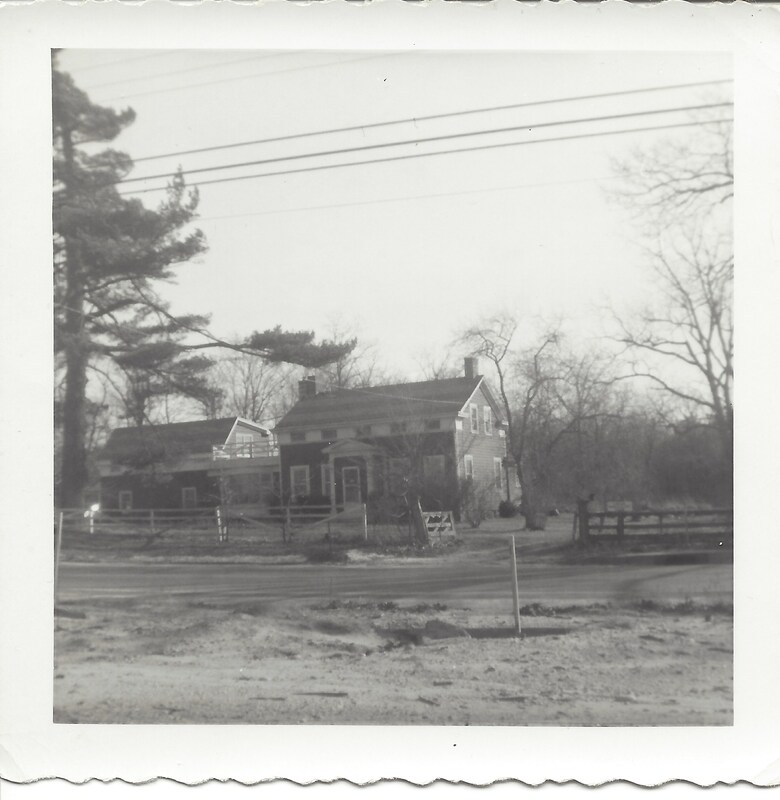 Through a tough and arduous process the Farmingville Reunion Association was able to donate their land to the county and have the former school masters house relocated next to the school at which he so diligently taught. 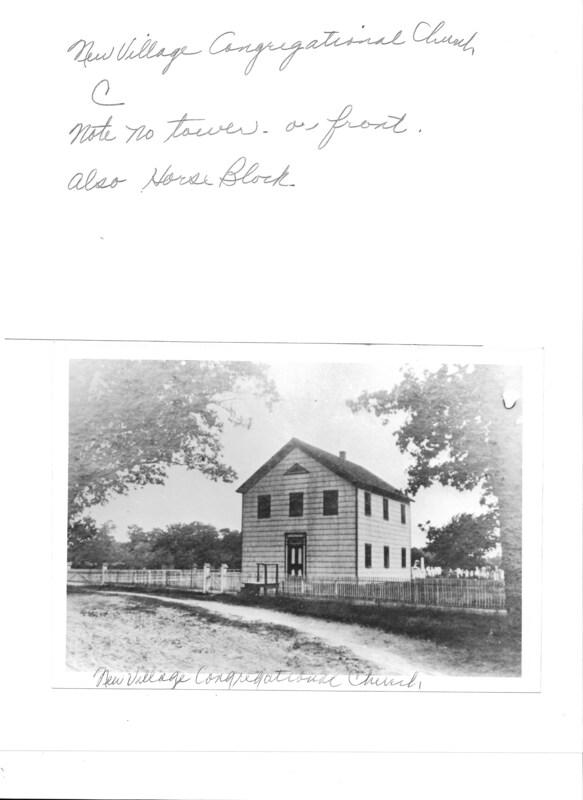 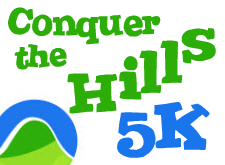 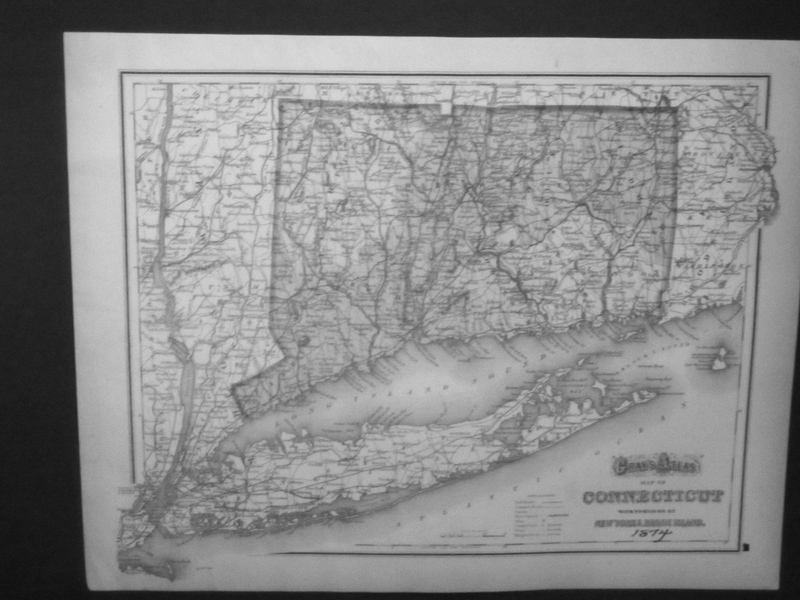 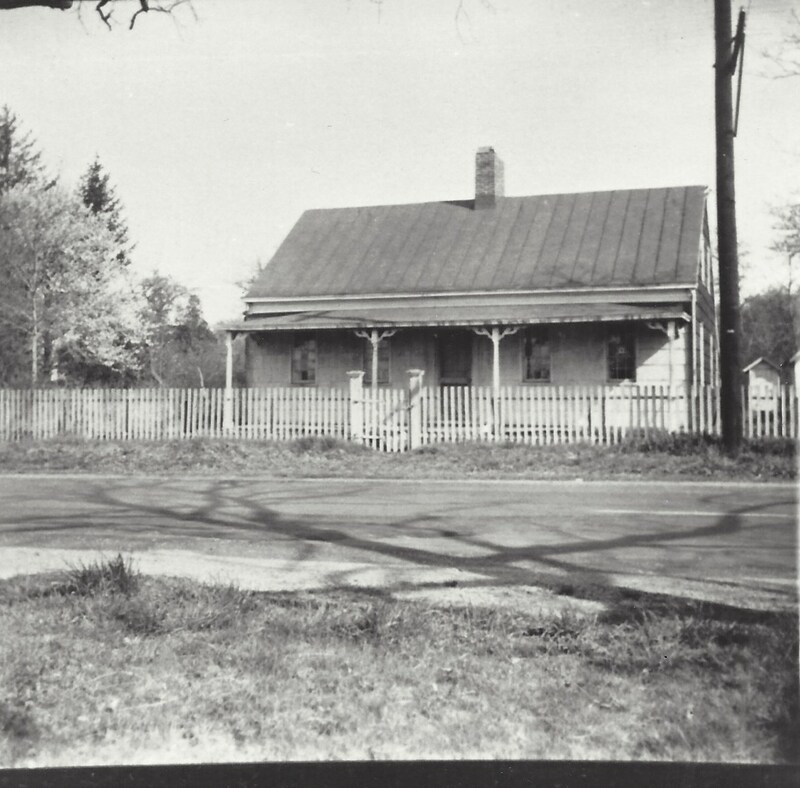 Through this process they relinquished their rights to the Bald Hill schoolhouse to the County. 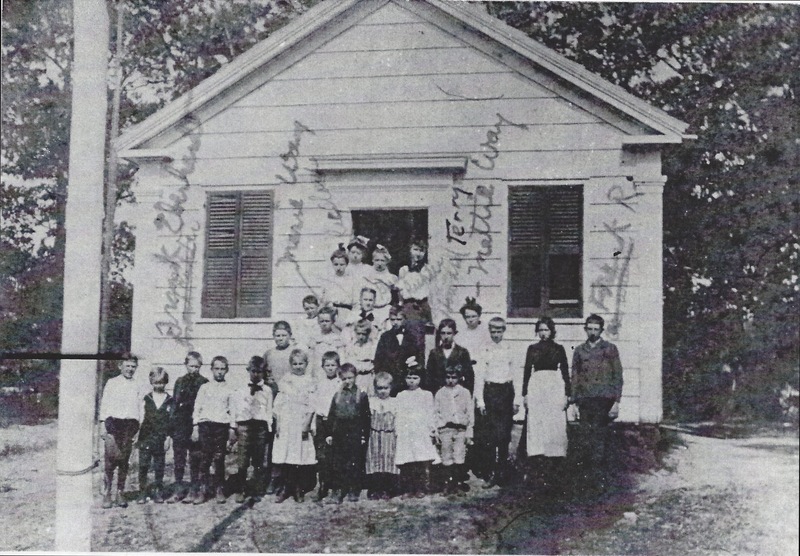 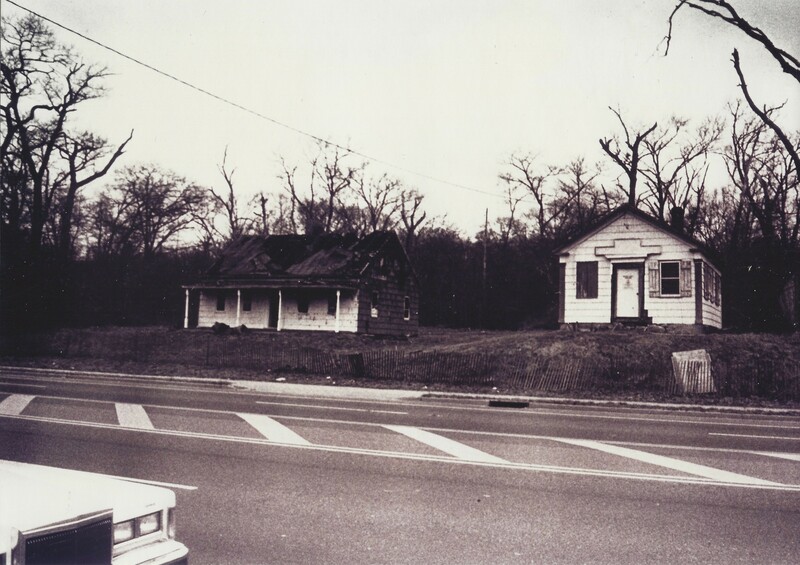 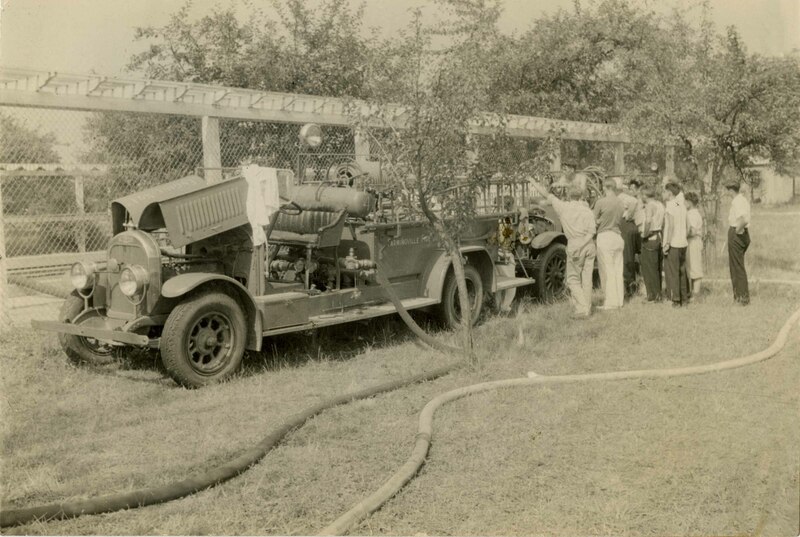 In 1992 the Bald Hill Schoolhouse suffered a tragic fire. 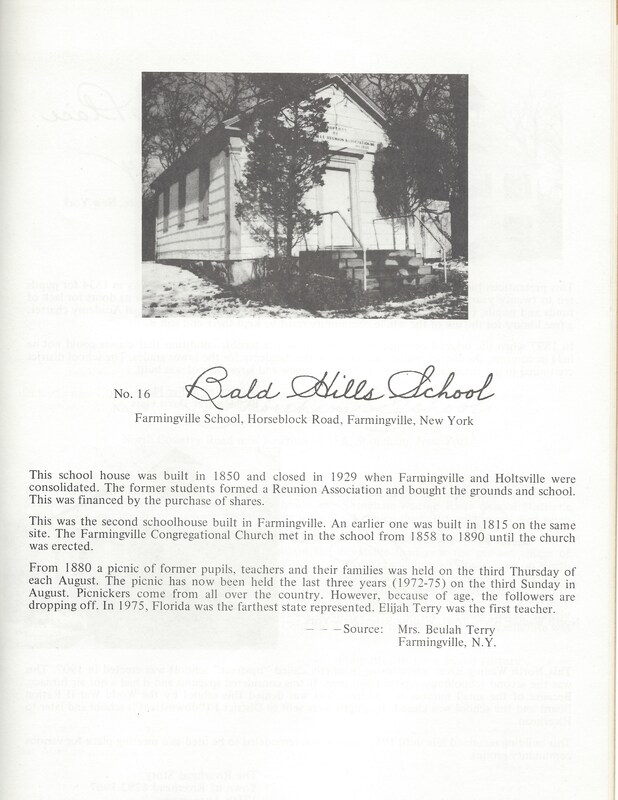 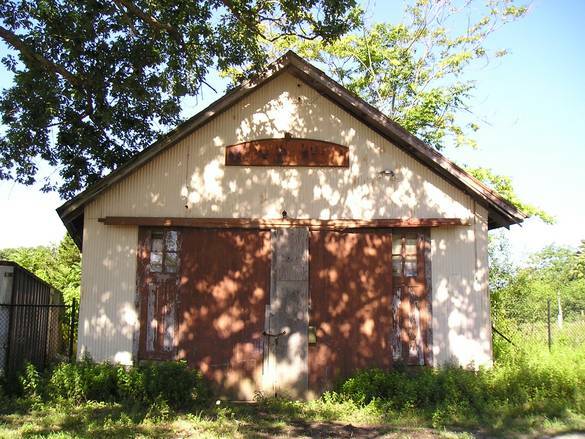 However, through the continued hard work and diligence the Farmingville Reunion Association, in conjunction with the Farmingville Historical Society, were able to raise a large sum to fix the Schoolhouse. 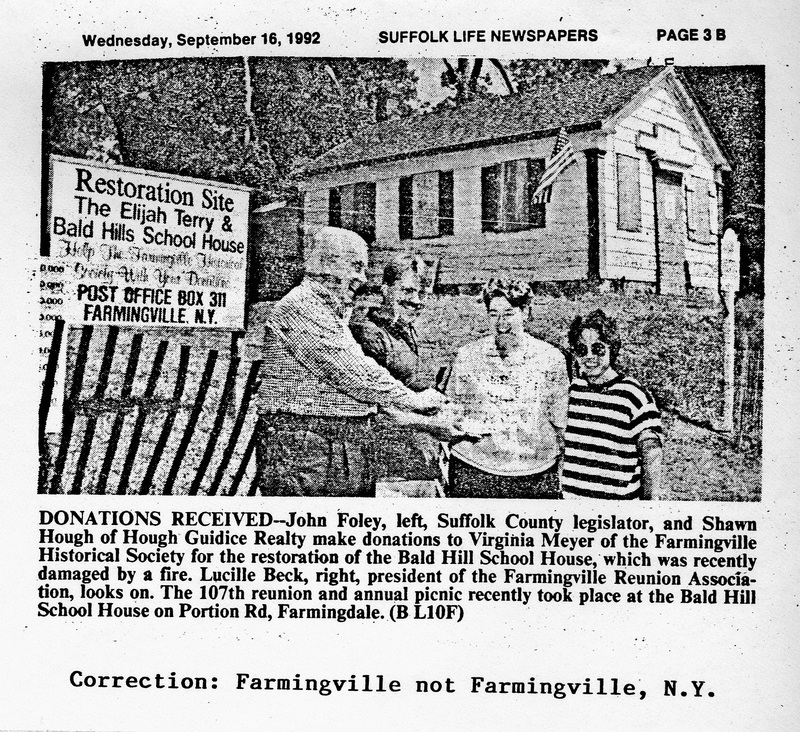 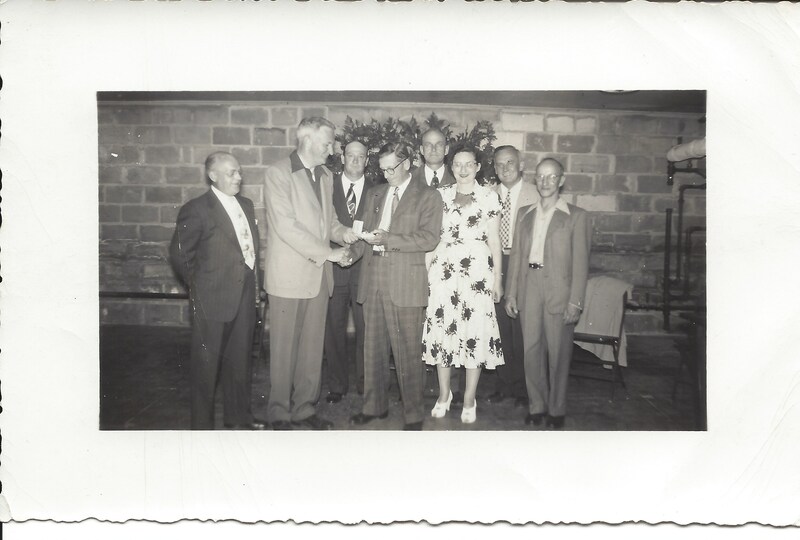 The picture below shows both the Farmingville Reunion Association and Farmingville Historical Society receiving a donation to help the Bald Hill Schoolhouse. 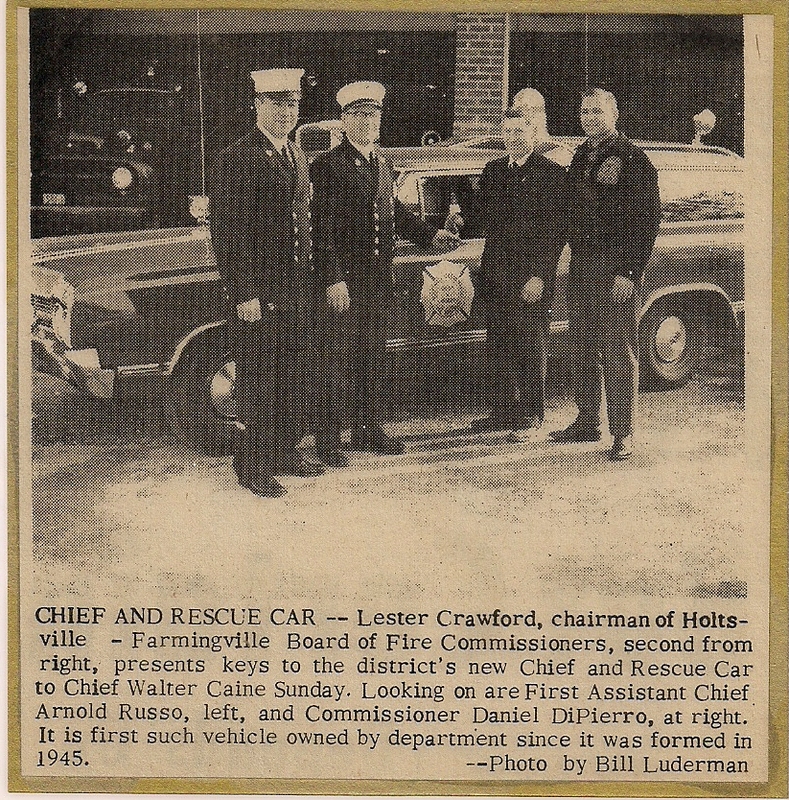 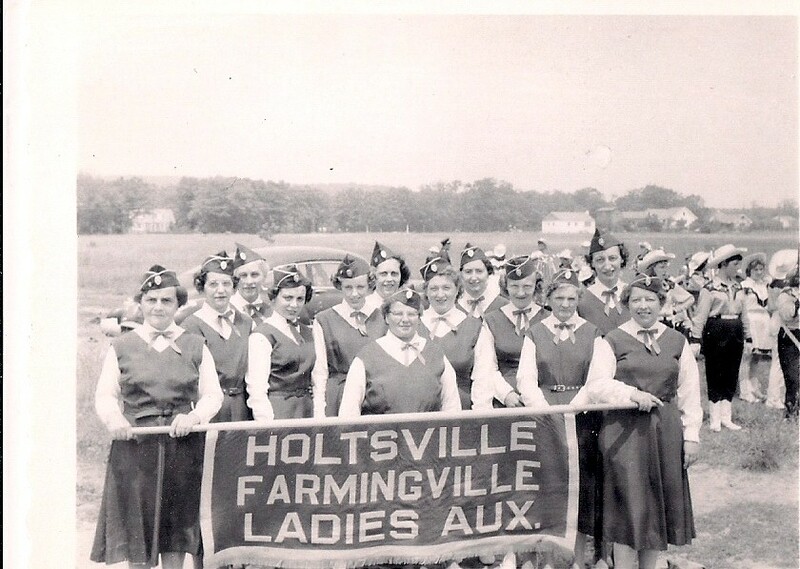 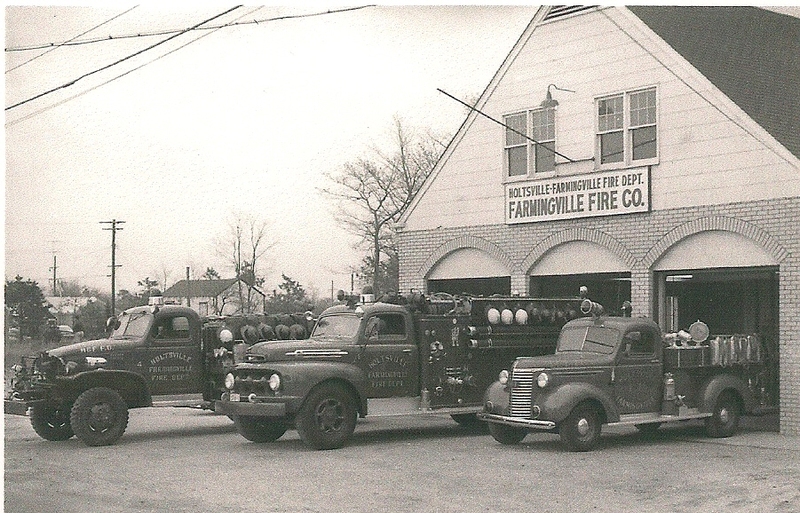 If it wasn’t for the dedication of those past students and their love for their home Farmingville would have surely lost out on having such important and historically necessary artifacts. 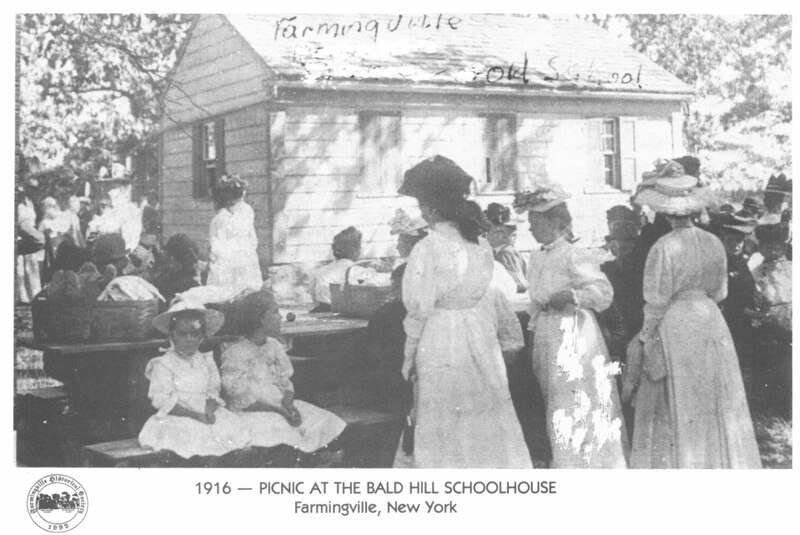 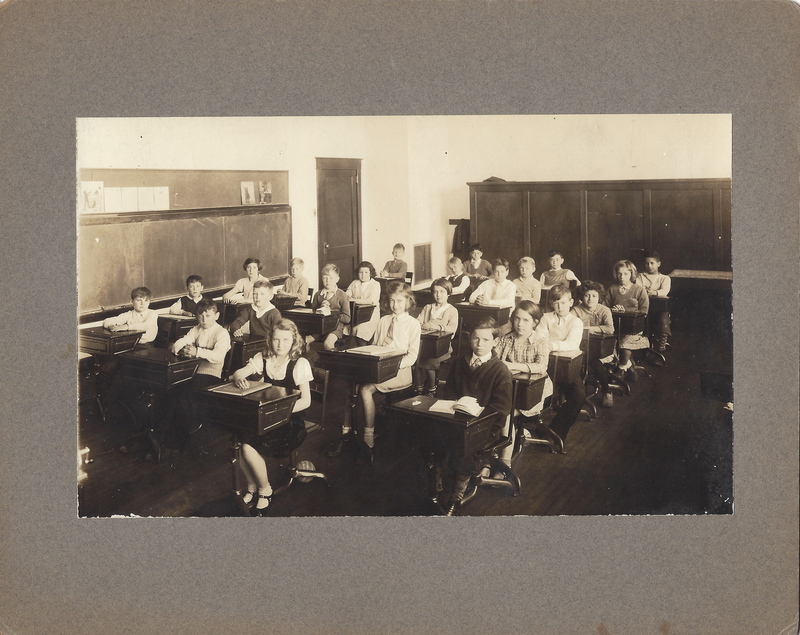 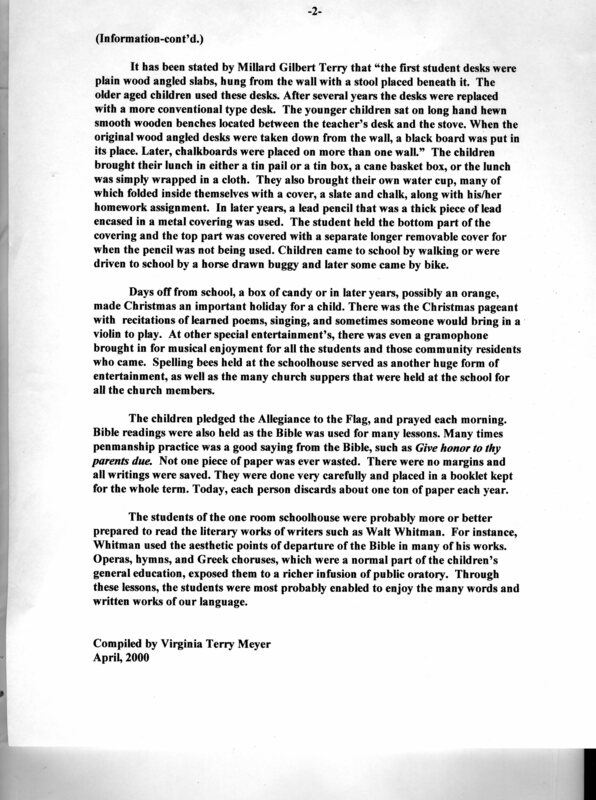 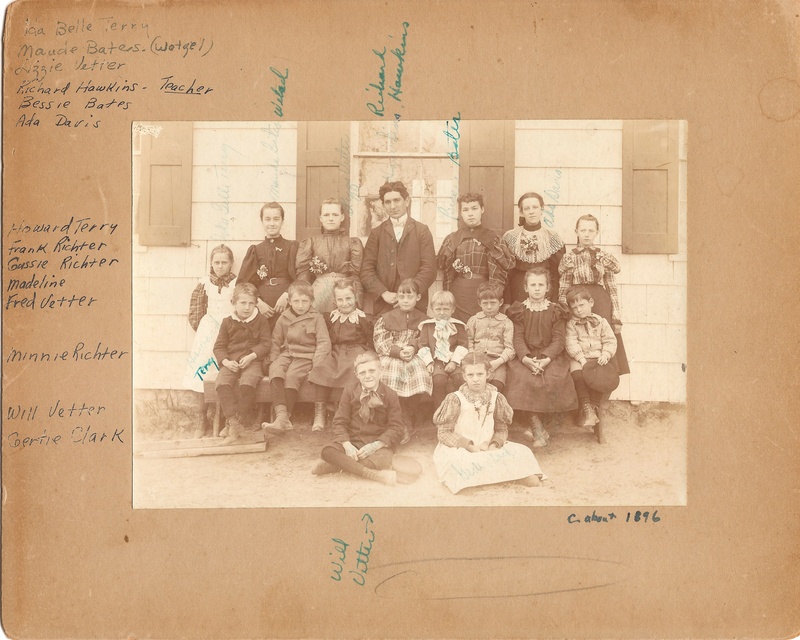 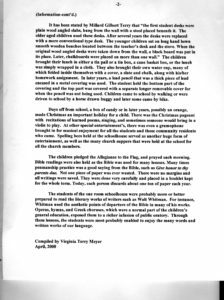 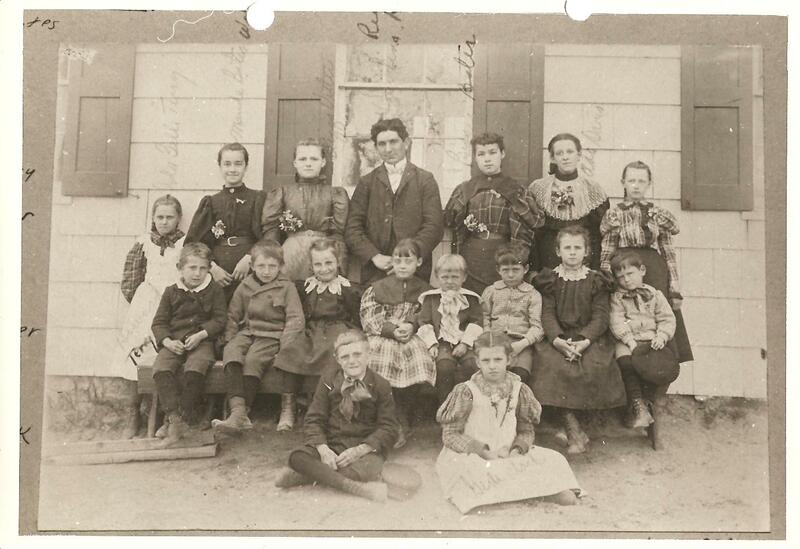 Below is a glimpse into the typical school day for those who attended the Bald Hill Schoolhouse.